The new era for Transformers begins now! After too-long an absence, the Robots in Disguise are back in comics form! 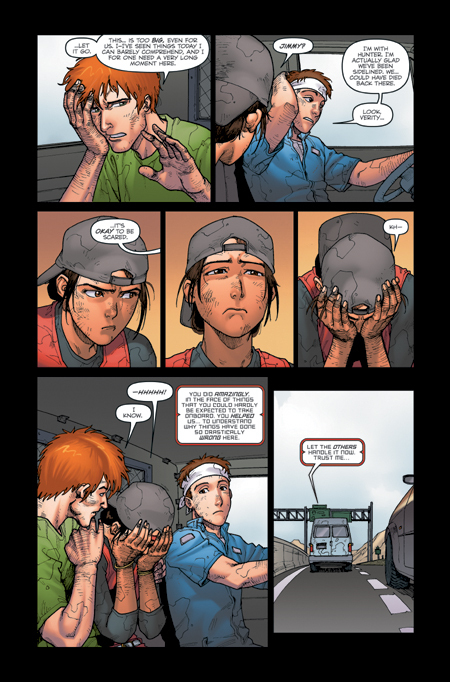 This is an all-new storyline and continuity that relaunches the Transformers from the ground up. If you’ve always been curious about these giant, transforming robots, this is the perfect jumping-on point! So far, in "Infiltration," we've had tantalizing hints about the state of play elsewhere in the TRANSFORMERS universe, but now we look in on Cybertron itself, unlocking a dark, dark chapter in the planet’s history, one that is about to hit the Autobots and Decepticons again... full force! With the monumental menaces of MEGATRON and Ore-13 looming, the Autobots could be forgiven for thinking things couldn't get much worse. But, as OPTIMUS PRIME musters his response to the mounting threat, the Machination strikes- with shocking and tragic consequences! Before allegiance, rank and function—before war—a civilian will become a warrior, a warrior will become a leader. As a leader he will learn of the most powerful weapon on the planet—a weapon powerful enough to bind legions to his will—a faction named DECEPTICON. This landmark story brings the major players of the faction together for the first time in a seminal story for MEGATRON, the DECEPTICONS, and THE GREAT WAR. In the aftermath of Escalation's thundering showdown in Brasnya, factions on Earth stir into bold and demonstrative action. With both the Machination and Skywatch poised to strike, each possessing CYBERTRONIAN tech and inside knowledge of the alien enemy they face, the AUTOBOTS have no choice but to relocate. But the arrival on Earth of the DECEPTICONS' living super-weapon, SIXSHOT, promises only one thing... Devastation. STORY: In this 16-page tale, runaway Verity Carlo absconds with a mini-computer that just might hold bigger secrets than she's prepared to handle. And when she's made aware of a larger conspiracy that involves gigantic alien robots, well, the skeptic in her refuses to believe what she's been told. Until she has no choice but to believe if she wants to survive at all! CAST: Verity Carlo, Hunter O'nion, Runabout, Runamuck, Thundercracker, Starscream, Ratchet. STORY: Earth: 2006, and the fate of the planet is already sealed, its destiny decided… by the marauding mechanical beings known as Decepticons. In their way stand an embattled crew of seven hardy Autobot warriors, sworn to prevent the impending Armageddon at any cost, and an unlikely trio of human misfits, pulled kicking and screaming into a hitherto hidden world of pain and hurt. The can of worms is open, the genie out of bottle… and nothing will ever be the same again! CAST: Verity Carlo, Hunter O'nion, Jimmy Pink, Runabout, Runamuck, Thundercracker, Starscream, Ratchet. STORY: Something is very wrong! For over two years, the Decepticon infiltration unit has been patiently building and fortifying its power base on Earth, maintaining an entirely covert presence. But now­open warfare rages on the roads and in the skies, and exposure seems a certainty. It's all falling apart, and Autobot medic Ratchet wants to know why. It seems Verity Carlo's stolen computer is the key, but the real trick is staying alive long enough to unlock its secrets. CAST: Verity Carlo, Hunter O'nion, Jimmy Pink, Runabout, Runamuck, Thundercracker, Starscream, Ratchet, Prowl, Ironhide, Sunstreaker. 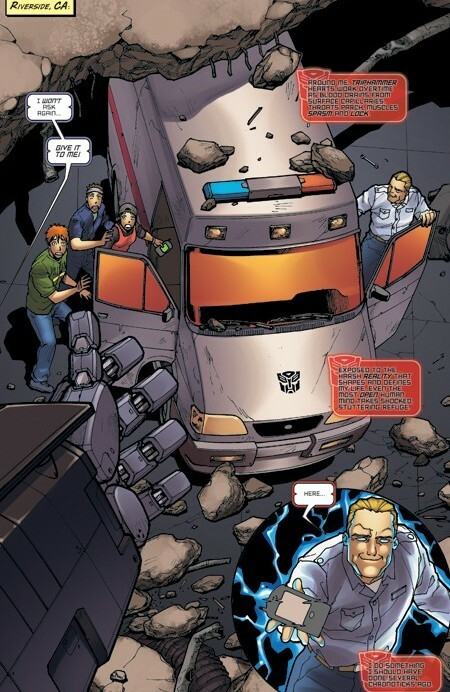 STORY: The assembled Autobots take center stage as the mystery surrounding the Decepticons’ sudden–and demonstrative–change of modus operandi deepens. Can Ratchet convince Prowl that drastic action needs to taken now, not later, action that involves a certain Optimus Prime? If not, well, it may be that Ratchet has to take some (more!) drastic action of his own. As for the Decepticons, they’re already braced for a response, Autobot or otherwise, and the first order of business… is to wipe out all remaining evidence! CAST: Verity Carlo, Hunter O'nion, Jimmy Pink, Skywarp, Blitzwing, Astrotrain, Starscream, Ratchet, Ironhide, Prowl, Sunstreaker, Wheeljack, Bumblebee, Jazz. STORY: Ratchet needs answers, before the crisis on Earth escalates, and that means sending a crack team deep—literally—into enemy territory. Too bad then, given Ratchet’s oath to protect human life, that his available resources amount to Verity, Hunter and Jimmy. Too bad also that Decepticon unit commander Starscream is intent on removing all evidence of his indiscretions, and that includes the particular bit of ‘enemy territory’ in question. Enter: Blitzwing and Skywarp! CAST: Verity Carlo, Hunter O'nion, Jimmy Pink, Skywarp, Blitzwing, Starscream, Megatron, Ratchet, Bumblebee. STORY: This is it–the one you’ve been waiting for! Megatron arrives on Earth, and he’s not in the best of moods. His local Decepticon infiltration unit has broken protocol and gone rogue, and he’s not about to take it lying down. Once he’s got the whys and wherefores, there’ll be due punishment meted out, starting with Skywarp and Blitzwing. What about the Autobots and their human allies? Well, they’re all (wisely) staying well out of harm’s way. All, that is, except for Verity Carlo, who’s set for her own, personal face-to-face with Megatron! CAST: Verity Carlo, Hunter O'nion, Jimmy Pink, Blitzwing, Skywarp, Megatron, Starscream, Prowl, Ironhide, Bumblebee Ratchet. STORY: The first titanic arc—Infiltration—wraps up in spectacular, no-holds-barred style, as Megatron sets about—demonstrably—putting his house (on Earth) in order. But, mighty as he is, has even Megatron got what it takes to curtail the activities of the all-new, hyper-powered Starscream? Whichever way it goes, the outlook looks distinctly bleak for the beleaguered earthbound Autobots. Could be that it’s time for Prowl and Co. to roll out the big guns? CAST: Verity Carlo, Hunter O'nion, Jimmy Pink, Runabout, Runamuck, Thundercracker, Astrotrain, Megatron Starscream, Ratchet, Ironhide, Bumblebee, Wheeljack, Jazz, Sunstreaker, Prowl, Optimus Prime. STORY: So far, in Infiltration, we've had tantalizing hints about the state of play elsewhere in the Transformers universe, but now we look in on Cybertron itself, unlocking a dark, dark chapter in the planet's history, one that is about to hit the Autobots and Decepticons again...full force! CAST: Jetfire, Scatershot, Strafe, Lightspeed, Afterburner, Nosecone, Optimus Prime, Searchlight, Thunderwing, Bludgeon, Bombburst, Skulgrin, Finback, Iguanas, Megatron. RELATED ISSUES: Transformers #3, Spotlight #1,#6. 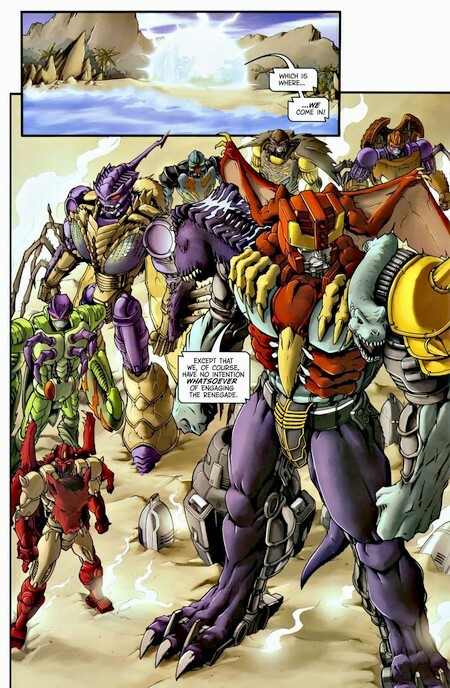 STORY: Captives of a mysterious cult worship the once and former “weapon of mass destruction” known as THUNDERWING, while OPTIMUS PRIME—the memory of the insane, tormented Decepticon scientist’s last near-apocalyptic rampage still uppermost in his anguished memory—unleashes his own last resort solution—the WRECKERS! CAST: Jetfire, Scatershot, Lightspeed, Strafe, Afterburner, Nosecone, Optimus Prime, Searchlight, Springer, Scoop, Roadbuster, Whirl, Twintwist, Topspin, Sandstorm, Broadside, Dogfight Thunderwing, Bludgeon, Bombburst, Skulgrin, Finback, Iguanas, Megatron, Darkwing, Dreadwind, Ruckus, Roadgrabber, Skullcruncher, Thrust, Crankcase. RELATED ISSUES: Transformers #7, Spotlight #1,#6. STORY: The action explodes on two fronts, as—on CYBERTON—the WRECKERS kick back (hard!) 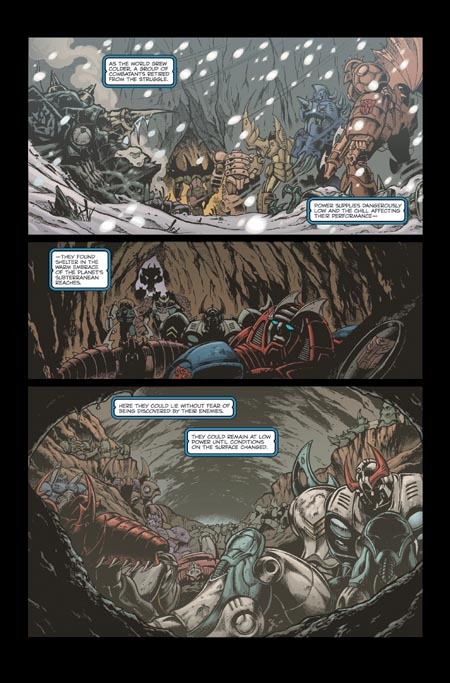 against BLUDGEON’s rogue cult, and—on Nebulos—THUNDERWING shows exactly why, last time around, it took the combined firepower of two armies just to put him on ‘pause.’ As events spiral out of control and the body count rises, MEGATRON prepares to execute his distinctly terminal no-win scenario. CAST: Jetfire, Afterburner, Nosecone, Optimus Prime, Springer, Scoop, Roadbuster, Whirl, Twintwist, Topspin, Sandstorm, Broadside, Dogfight Thunderwing, Bludgeon, Bombburst, Skulgrin, Finback, Iguanas, Megatron, Darkwing, Dreadwind, Ruckus, Roadgrabber, Skullcruncher, Thrust, Crankcase, Razorclaw. RELATED ISSUES: Transformers #7-#8, Spotlight #1,#6. STORY: The spotlight falls on Shockwave, as the coldly logical Decepticon undertakes a plan of devastating scope and ambition...one that will send shockwaves through the entire saga, including the Stormbringer and Escalation series and beyond! CAST: Shockwave, Grimlock, Slag, Sludge, Snarl, Swoop, Optimus Prime. STORY: Out of control, acting on pure, devastating instinct, THUNDERWING descends once again on CYBERTRON, with only a skeleton force of Autobots under the command of OPTIMUS PRIME to oppose him. While JETFIRE searches frantically for options, uncovering more mysteries in the process, the countdown to the total destruction of CYBERTRON continues. The line has been drawn, and-one way or another-it all ends here. CAST: Jetfire, Afterburner, Nosecone, Lightspeed, Scattershot, Strafe, Optimus Prime, Springer, Scoop, Roadbuster, Whirl, Twintwist, Topspin, Sandstorm, Broadside, Dogfight Thunderwing, Megatron, Razorclaw, Tantrum, Headstron, Divebomb, Rampage. RELATED ISSUES: Transformers #7-#9, Spotlight #1,#6. STORY: The spotlight falls on NIGHTBEAT, as he investigates one of the greatest Cybertronian mysteries... the disappearance of the first Ark! However, some mysteries, it seems, are better left unsolved! STORY: The saga of the TRANSFORMERS secret war on Earth—begun in Infiltration—continues with Phase Two: Escalation. With the monumental menaces of MEGATRON and Ore-13 looming, the Autobots could be forgiven for thinking things couldn’t get much worse. But, as OPTIMUS PRIME musters his response to the mounting threat, the Machination strikes… with shocking and tragic consequences! CAST: Drake, Verity Carlo, Hunter O'nion, Jimmy Pink, Ironhide, Jazz, Sunstreaker, Ratchet, Prowl, Optimus Prime, Megatron, Astrotrain, Blitzwing, Runabout, Runamuck, Skywarp, Thundercracker. RELATED ISSUES: Transformers #0-#10, Spotlight #1,#6. STORY: The spotlight falls on HOT ROD, as the daredevil Autobot undertakes a solo mission firmly filed and stamped: impossible! But what is the Magnificence, and how does it all connect with HOT ROD’s first—disastrous—mission? CAST: Hot Rod, Double Dealer, Backbeat, Download, Gizmo, Banzaitron. 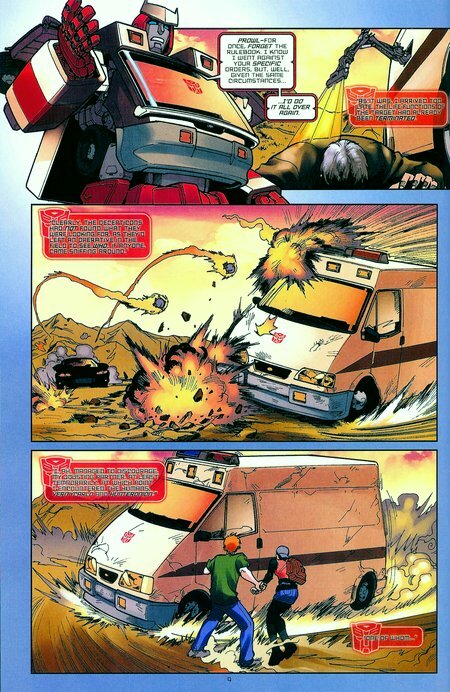 STORY: The shocking events of last issue leave the AUTOBOTS reeling. Their number diminished by one, they struggle to come to terms with the whys and wherefores of the Lebanon interception. Similarly, the two humans still standing want answers... and action! And, as if this wasn't enough to contend with, the true, staggering scope of the DECEPTICON Infiltration gambit is revealed! CAST: Drake, Verity Carlo, Jimmy Pink, Ironhide, Jazz, Ratchet, Prowl, Optimus Prime, Megatron, Runabout, Runamuck, Skywarp, Thundercracker. STORY: The spotlight falls on SIXSHOT, as the DECEPTICONS' living weapon- teetering on the edge of a potentially catastrophic mental breakdown- goes in search of the TERRORCONS, the mysterious Reapers and, perhaps, redemption. CAST: Sixshot, Hun-grr, Sinnertwin, Rippersnapper, Cutthroat, Blot, Beast Box, The Reapers. STORY: The action erupts onto the world stage, as MEGATRON and his DECEPTICONS stir things up in the disputed (breakaway) Soviet state of Brasnya, initiating an incendiary border conflict. Meanwhile, the AUTOBOTS—aware that one of the DECEPTICONS’ (facsimile) bio-constructs is active in the area—move to intercept, setting up a truly explosive confrontation. CAST: Georgi Koska, Verity Carlo, Jimmy Pink, Ironhide, Jazz, Ratchet, Prowl, Bumblebee, Nightbeat, Hot Rod, Hardhead, Optimus Prime, Megatron, Skywarp, Blitzwing. RELATED ISSUES: Transformers #0-#6,#11-#12, Spotlight #2. STORY: The spotlight falls on ULTRA MAGNUS, the AUTOBOTS' implacable, upstanding long arm of the (intergalactic) law. But now- in pursuit of his "most wanted" (and elusive) adversary- just how far (outside the law) is MAGNUS willing to go? CAST: Ultra Magnus, Scorponok, Swindle, Zarak. STORY: Things go ballistic in Brasyna, as—with the world watching—the AUTOBOTS and DECEPTICONS clash in the no man's land between two opposing armies on a hair-trigger. And... OPTIMUS PRIME and MEGATRON square up for their first full on, one-on-one battle in many millennia! And... HOT ROD, NIGHTBEAT and HARDHEAD pitch in. And... Verity and Jimmy walk into the lion's den (again!) Phew! CAST: Georgi Koska, Verity Carlo, Jimmy Pink, Ironhide, Jazz, Ratchet, Prowl, Nightbeat, Hot Rod, Hardhead, Optimus Prime, Megatron, Skywarp, Blitzwing, Astrotrain. STORY: The spotlight falls on SOUNDWAVE, the Decepticon intelligence officer with a knack of, first and foremost, looking out for number one! Confronted (on Earth, in 1984!) by an impending catastrophe only he can avert, will Soundwave, for once, consider the bigger picture? By Simon Furman and Marcelo Matere. CAST: Soundwave, Megatron, Bludgeon, Bombburst, Iguanus, Ravage, Laserbeak, Joshua Red. RELATED ISSUES: Transformers #7-#10, Spotlight #1. STORY: This is it! The all-out, no-holds-barred battle you’ve all been waiting for... OPTIMUS PRIME vs. MEGATRON! 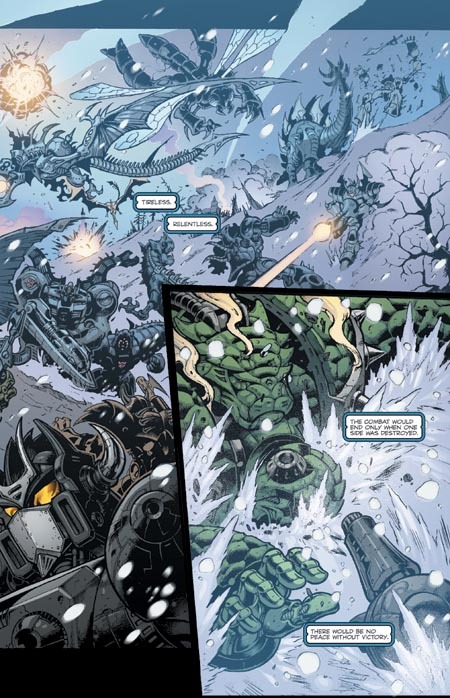 In the icy wasteland between Russia and Brasnya, the two titans clash for the first time in many millennia, and MEGATRON’s playing for keeps. Empowered by Ore-13, MEGATRON wants nothing less than the AUTOBOT leader’s complete and utter eradication. And the way things are going… he might just get his wish! By Simon Furman (Transformers: Stormbringer) and E.J. Su (Transformers: Infiltration), with a variant cover once again provided by Klaus Scherwinski. CAST: Optimus Prime, Prowl, Hot Rod, Hard Head, Wheeljack, Jazz, Ratchet, Ironhide, Verity Carlo, Jimmy Pink, Georgi Koska, Mr. Dante, Megatron, Skywarp, Astrotrain. RELATED ISSUES: Transformers #0-#6,#11-#14, Spotlight #1. STORY: In this Spotlight on the grizzled old TRANSFORMER, Kup finds himself stranded, facing shutdown, and fighting evil that just might be all in his mind. Alex Milne joins the cause, too, presenting a special variant cover that shows just what Kup is up against in this Spotlight. DESCRIPTION: The Autobots are a group of Transformers dedicated to stopping the Decepticons from depleting the universe of all it's energy. The Autobots are lead by one Transformer, who carries the Suffix "Prime". PRIMARY FUNCTION: Technobots - Data Analyst. LAST KNOWN LOCATION: Cybertron (Transformers #10). CURRENT STATUS: Online (Transformers #10). PRIMARY FUNCTION: Hot Rod's T.R.U. - Soldier. LAST KNOWN LOCATION: Ki Alleta (Spotlight #3). CURRENT STATUS: Offline (Presumed De-Activated) (Spotlight #3). ALT MODES: Cybertronian Land Vehicle. PRIMARY FUNCTION: Ops Command Hub - Communications. LAST KNOWN LOCATION: Ops Command Hub (Transformers #7). CURRENT STATUS: Online (Transformers #7). PRIMARY FUNCTION: Ark-19 Tactical Response Unit-Soldier. LAST KNOWN LOCATION: Earth (Transformers #13). CURRENT STATUS: Online (Transformers #13). ALT MODES: Earth Retro Volkswagen Beetle. ABILITIES: In vehicle mode, Bumblebee's weapon can extend out from his hood. MEMORABLE QUOTES: "Couldn't help but overhear...largely because i was lurking back hear, where I had no good reason to be." BIO: Like both Ratchet and Ironhide, Bumblebee isn't afraid to disobey orders or brake protocol if he believes it necessary. PRIMARY FUNCTION: Wreckers - Aerial Assault. PRIMARY FUNCTION: Ark-27 - Pilot. LAST KNOWN LOCATION: Ark-27 (Transformers #10). LAST KNOWN LOCATION: Ark-27 (Transfomers #10). CURRENT STATUS: Online (Transfomers #10). PRIMARY FUNCTION: Tactical Response Unit. LAST KNOWN LOCATION: Earth (Transformers #15). CURRENT STATUS: Offline (Stasis Lock) (Transformers #15). 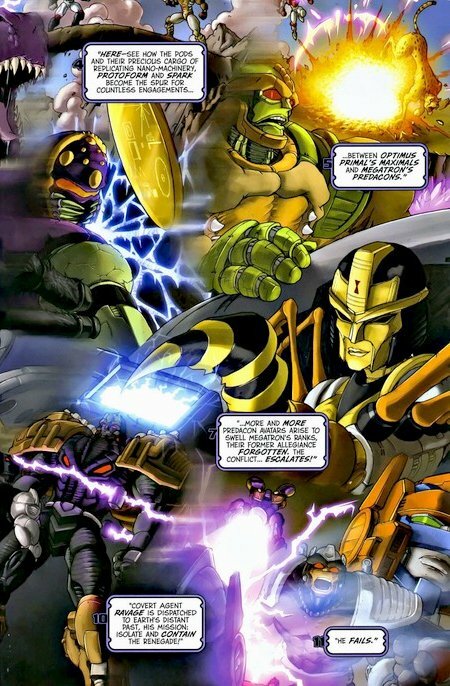 APPEARANCES: Transformers #15, Spotlight #1.
b]BIO:[/b] The Dynobots a are gorup of very powerful and very capable soldiers. PRIMARY FUNCTION: Dynobot Tactical Response Team-Commander. LAST KNOWN LOCATION: Earth (Spotlight #1). CURRENT STATUS: Offline (Stasis Lock) (Spotlight #1). ALT MODES: Cybertronian Tank, Earth Tyrannosaurus Rex. ABILITIES: In beast mode, Grimlock has twin missile launchers located in his mouth. MEMORABLE QUOTES: "Look again, find me something with bite. Unless plan is to make Shockwave die laughing." BIO: During a battle with Shockwave, the Dynobots suffered extreme Energon burns and were in C.R. Chambers for almost a Deca-cycle, because of this, Grimlock's sole purpose is to seek revenge against Shockwave. LAST KNOWN LOCATION: Earth (Transformers #16). CURRENT STATUS: Online (Transformers #16). ABILITIES: In robot mode, Hardhead has a shoulder mounted cannon. MEMORABLE QUOTES: "One facsimile, tag and bag." BIO: Hardhead is an above average fighter and has above average strength. ABILITIES: In robot mode, Hot Rod has lasers mounted on both his wrists. APPEARANCES: Transformers #13-#16, Spotlight #3. MEMORABLE QUOTES: "Hey Nightbeat, you can sit tight if you want. Me and Hardhead, we're going in! Hoohah!" "ER, if that is operational jargon for gettin shot... I vote you." BIO: If there's a line, Hot Rod will cross it; if there's a knot, he'll cut it; if there's a risk, he'll take it... smiling. In his solitary world, there's no room for second thoughts, no margin for error. "Out there" is a permanent state of mind, and the more impossible, the more downright insane the mission, the better this daredevil Autobot likes it. (Simon Furman, Hot Rod Spotlight). LAST KNOWN LOCATION: Ki-Aleta (Spotlight #3). CURRENT STATUS: Partially Online (Spotlight #3). BIO: Hot Rod’s T.R.U. was assigned to recover the Magnificence, an all seeing oracle. PRIMARY FUNCTION: Tactical Response Unit - Commander. CURRENT STATUS: Unknown (Transformers #16). ABILITIES: While in vehicle mode, Ironhide has roof-mounted weapons. MEMORABLE QUOTES: "I say we take this right to their door, and kick it in!" BIO: More the most part, Ironhide is willing to follow his commander's orders. But if he believes that further action needs to be taken, he will disobey these orders. ABILITIES: In robot mode, Jazz can store his weapon in his right thigh. While in vehicle mode, Jazz is capable of deploying twin cannons from his rear. APPEARANCES: Transformers #3, #6, #11-#16. MEMORABLE QUOTES: "I never even knew the smile was freaking people out." BIO: Jazz is very interested with learning more about the human culture. He is a reliable soldier, and is usually paired with Wheeljack. ABILITIES: In robot mode, Jetfire has armour plating that includes a face-plate. BIO: An experienced scientist who currently oversees the Technobots, Jetfire has a history with looking for solutions. When in a position to investigate the Energon anomaly on the now-dead Cybertron, he doesn’t stick to the safe, distant method; rather he leads a team onto the surface of the volatile planetoid. Jetfire knows his place well, when leading his team he shows great composure, control and fortitude. When under the command of Optimus Prime, he puts his best talents to work providing answers for the most imperative questions-how to stop Thunderwing? LAST KNOWN LOCATION: Unknown (Spotlight #7). CURRENT STATUS: Online (Spotlight #7). BIO: Kup is one of the oldest Autobots in comission. He has trained a large number of Autobots including; Opitmus Prime, Springer, Sideswipe and Sunstreaker. Because of Kup's unwilingness to upgrade his body, it is hard for repairs to be made. * Due to radioactive crystals on the surface of the planet, and the period of time Kup has been alone, his mental state has decayed considerably. LAST KNOWN LOCATION: Earth orbit (Transformers #16). ALT MODES: Gorlam Prime Car. ABILITIES: Nightbeat is able to transmit information directly to his ship. In robot mode, Nightbeat has a torch built in to his right wrist. In vehicle mode, Nightbeat has weapons which can extend from his front. APPEARANCES: Transformers #13-#16, Spotlight #2. MEMORABLE QUOTES: "The name's Nightbeat, solving mysteries is what I do." BIO: A lone wolf, ceaselessly questing, searching for answers to problems big and small, his irregular and unconventional logic, combined with a keen, probing intellect, makes him perfect for the toughest, most convoluted investigations. Nightbeat loves nothing more than a mystery the bigger the better, and he never, ever, gives up once he has the scent. (Simon Furman, Nightbeat Spotlight). LAST KNOWN LOCATION: Cybertron (Transfomers #8). CURRENT STATUS: Online (Transfomers #8). PRIMARY FUNCTION: Commander in Chief. CURRENT STATUS: Offline (Assumed De-Activated )(Transformers #15). ABILITIES: Optimus Prime's trailer transforms into a small battle station with a mobile armoured car named "Roller". While in robot mode, Optimus Prime is able to download his core consience into his trailer. APPEARANCES: Transformers #6-#16, Spotlight #1- #2. MEMORABLE QUOTE: "Get me the Wreckers". BIO: Unless the situation requires his specific presence, Optimus Prime's co-ordinates the war from his the Autobot Orbital Command Hub. Although Optimus Prime may step in and take overall charge over a Tactical Response Unit, he seeks advice from the unit commanders. CURRENT STATUS: Offline (Spotlight #7). PRIMARY FUNCTION: Ark-27 - Soldier. LAST KNOWN LOCATION: Cybertron (Transformers #7). APPEARANCES: Transformers #7, Spotlight #7. PRIMARY FUNCTION: Ark-19 Tactical Response Unit-Commander. 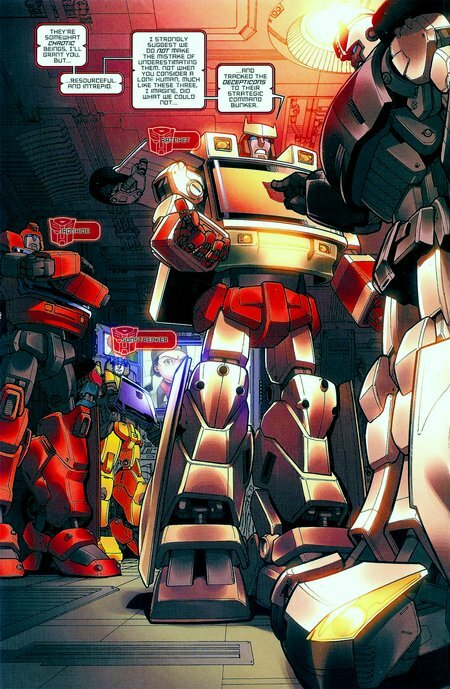 LAST KNOWN LOCTAION: Earth (Transformers #16). ALT MODES: Earth Police Car. ABILITIES: While in vehicle mode, Prowl has front-mounted weapons. MEMORABLE QUOTES: "Ironhide, you and I need to have words!" BIO: Prowl follows policy and procedure to the letter, because of this, he has trouble controlling some of his more pro-active subordinates. At some point in time, Prowl was a member of the Autobot High Justice. PRIMARY FUNCTION: Ark-19 Tactical Response Unit-Medic. ABILITIES: Ratchet has a retractable weapon stored in his right wrist. In vehicle mode, Ratchet can employ a number of gadgets, including; top mounted dual cannon, side mounted sonic canons, speed boosting rockets and a parachute. MEMORABLE QUOTES: "This is where I wish I had a really big gu-." BIO: Ratchet isn't afraid to break protocol if the situation requires it. He is reluctant to put the humans at risk, but understands that it may be required to serve the greater good. PRIMARY FUNCTION: Wreckers - Ground Assault. MEMORABLE QUOTES: "I doubt he's applauding our efforts". PRIMARY FUNCTION: Technobots - Commandet. PRIMARY FUNCTION: Wreckers - Ground Excavation. ALT MODES: Cybertronian Earth Mover. CURRENT STATUS: Online (Transformers #11). CURRENT STATUS: Online (Spiotlight #7). LAST KNOWN LOCATION: Ark-17 (Spotlight #7). PRIMARY FUNCTION: Dynobot – Close Range Fire Support. CURRENT STATUS: Stasis Lock (Spotlight #1). PRIMARY FUNCTION: Dynobot – Heavy Artillery. PRIMARY FUNCTION: Dynobot – Soldier. APPEARANCES: Transformers #8-#10, Spotlight #7. BIO: Springer leads with is mouth, and with his head. The tough members of the Wreckers all would put their lives on the line for the Autobot cause, and none more so than Springer. He’s always got a solution, and usually it involves hard-hitting and surprise tactics from under or above enemy lines (courtesy of Scoop and Twin Twist). Springer feels a sense of duty to Kup, who he received traing from. LAST KNOWN LOCATION: Earth (Transformers #11). CURRENT STATUS: Presumed Destroyed (Transformers #11). APPEARANCES: Transformers #2-#3, #6, #11. MEMORABLE QUOTES: "Er, what are the humans doing out." BIO: Although Sunstreaker doesn't appear to like humans, he will protect them if he is ordered to. UNIT MEMBERS: Strafe, Lightspeed, Nosecone, Afterburner. b]BIO:[/b] The Technobots are more or less a group of scientists. MEMORABLE QUOTES: "Leave this, to the profesionals." PRIMARY FUNCTION: Force Field Specialest. ABILITIES: Trailbreaker is able to creat force fields in a localised area. PRIMARY FUNCTION: Wreckers - Sub-Terrainean Assault. PRIMARY FUNCTION: Enforcer of the Tyrest Accord. LAST KNOWN LOCATION: Buras (Spotlight #5). CURRENT STATUS: Online (Spotlight #5). ABILITIES: In both modes, Ultra Magnus has twin missile launchers. MEMORABLE QUOTES: "I am a duly appointed enforcer of the Tyrest Accord, we can do this my way, or the hard way." BIO: Even in war, there are codes of conduct that must be abided by and, when there are transgressions, enforced. In this respect, Ultra Magnus is the law. Though an Autobot by allegiance, Ultra Magnus fulfils a largely autonomous role, investigating, assessing and-if necessary-punishing those who cross the line drawn in the sand. (Simon Furman, Ultra Magnus Spotlight). ABILITIES: In robot mode, Wheeljack has twin mounted cannons on his shoulders. While in vehicle mode, Wheeljack is capable of deploying twin cannons from his rear. UNIT MEMBERS: Broadside, Sandstorm, Twintwist, Topspin, Scoop, Roadbuster, Whirl. BIO: The Wreckers are Autobot’s big hitters. They are called in when the situation has escalated to beyond normal means of warfare. DESCRIPTION: The Decepticons are a group of Transformers whose goal is to usurp control of the universe's energy. PRIMARY FUNCTION: Infiltration Unit – Orbital Offence. ALT MODES: Earth Space Shuttlet. APPEARANCES: Transformers #3, #6, #16. BIO: Astrotrain is a very capable soldier and is a virtual second in charge in the infiltration unit. PRIMARY FUNCTION: Officer - Decepticon Intelligence. LAST KNOWN LOCATION: Unknown (Spotlight #3). CURRENT STATUS: Online (Spotlight #3). BIO: Banzaitron is an officer of the Decepticon Intelligence Unit. LAST KNOWN LOCATION: Decepticon Spacecraft Thanatos(Transformers #10). PRIMARY FUNCTION: Infiltration Unit – Heavy Artillery. LAST KNOWN LOCATION: Earth (Transformers #14). CURRENT STATUS: Online (Transformers #14). ALT MODES: Earth Tank, Earth Jet. ABILITIES: Blitzwing has two different alt. Modes. Blitzwing can engage Chameleon-Mesh, rendering him invisible. BIO: Much, like other Decepticon soldiers, Blitzwing is happy to follow orders, especially when he gets to blow stuff up. Blitzwing is often paired with Skywarp. PRIMARY FUNCTION: Terrorcon Unit - Soldier. LAST KNOWN LOCATION: Mumu-Obscurra (Spotlight #4). CURRENT STATUS: Online (Spotlight #4). ABILITIES: None revealed so far. APPEARANCES: Transformers #7-#10, Spotlight #6. BIO: Bludgeon is both an efficient warrior and a competent scientist. He admires the work and vision of the Decepticon scientist Thunderwing, and yearns to revitalize the war-devastated Cybertron and restore it to its former glory. LAST KNOWN LOCATION: Cybertron (Transformers #9). CURRENT STATUS: Offline (Transformers #9). APPEARANCES: Transformers #7-#9, Spotlight #6. PRIMARY FUNCTION: Infiltratoon Unit - Soldier. 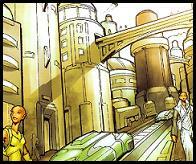 LAST KNOWN LOCATION: Nebulos (Transformers #9). CURRENT STATUS: Offline (Presumed Destroyed) (Transformers #9). UNIT MEMBERS: Skullgrin, Bombburst, Iguanas, Finback. BIO: The Cult of Thunderwing worship Thunderwing for his work and vision. PRIMARY FUNCTION: Infiltratoon Unit - Commander. CURRENT STATUS: Online (Transformers #9). BIO: Darkwing appears to be very close to Dreadwind. PRIMARY FUNCTION: Predacon Unit - Soldier. ABILITIES: In robot mode, Double Dealer has a large canon mounted on his right shoulder. BIO: Double Dealer is a spy placed in the Autobot ranks by the Decepticon Banzaitron. His cover is “Dealer”. BIO: Dreadwind appears to be very close to Darkwing. LAST KNOWN LOCATION: DEcepticon Penal Colony Styx (Spotlight #3). CURRENT STATUS: Active (Spotlight #3). * Gutcrucher was on Styx when Hot Rod rescued Double Dealer. PRIMARY FUNCTION: Terrorcon Unit - Comander. CURRENT STATUS: Offline (Transformers #16). APPEARANCES: Transformers #16, Spotlight #6. BIO: Laserbeak is a loyal agent of Soundwave. ALT MODES: Cybertronian tank, Earth Walther P-99 pistol. 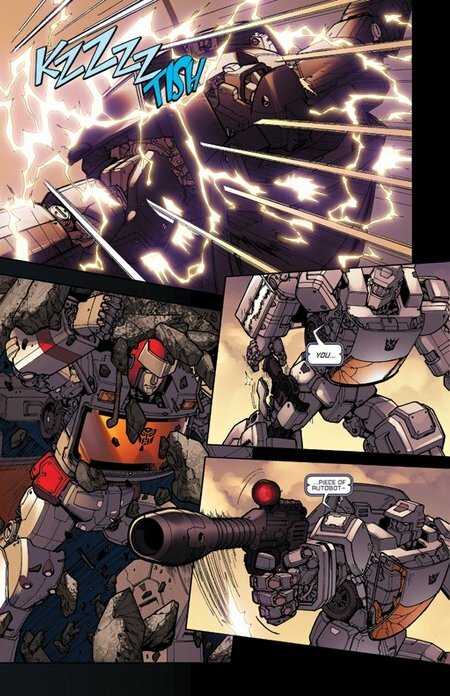 ABILITIES: Megatron’s transformation uses “Mass Displacement” technology, allowing him to shrink considerably. In robot mode, Megatron has a powerful fusion canon mounted on his right arm. While powered by Ore-13, Megatron is capable of firing blasts of energy from his mouth. APPEARANCES: Transformers #4-#16, Spotlight #1,#6. MEMORABLE QUOTES: “Take your punishment like a Decepticon.” “If entire worlds must burn, then so be it.”"I need no weapons to kill you, Prime...bare hands will surfice!" BIO: Much like his counterpart Optimus Prime, Megatron doesn’t get first hand involved in the war unless the situation requires it. Megatron is willing to tolerate insubordination to some degree. CURRENT STATUS: Partially Online (Transformers #9). UNIT MEMBERS: Dreadwind, Skullcruncher, Thrust, Roadgrabber, Cankcase, Ruckus. BIO: The Infiltration unit were assigned to Nebulos. LAST KNOWN LOCATION: Cybertron Orbit (Transformers #10). UNIT MEMBERS: Headstrong, Rampage, Divebomb, Tantrum. 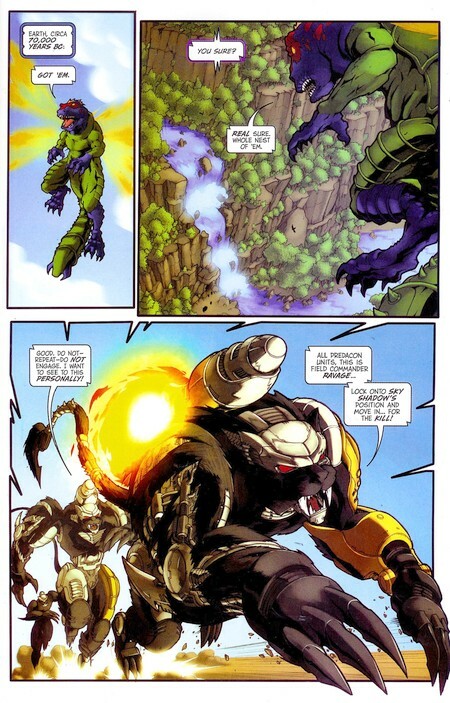 b]BIO:[/b] The Predacons are Megatron’s enforcers, he utilises them for volatile situations. 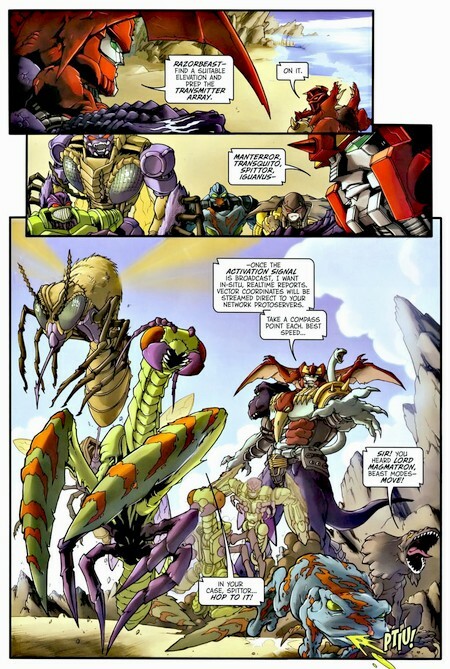 The Predacons appear to have a sense of honour. BIO: Ravage is a loyal agent of Soundwave. PRIMARY FUNCTION: Predacon Unit - Commander. PRIMARY FUNCTION: Infiltration Unit-Covert Ground Surveillance. ALT MODES: Earth Chevrolet Camaro. ABILITIES: In vehicle mode, Runabout can alter his exterior to reveal battering panels, and is capable of launching missiles. APPEARANCES: Transformers #0-#2, #6, #11-#13. BIO: Runabout is more than happy to follow orders, as long as they mean he can cause destruction. Runabout is often paired with Runamuck, whom he shares a tight bond with, and often finishes his sentences. ABILITIES: In vehicle mode, Runamuck can alter his exterior to reveal battering panels, and is capable of launching missiles. BIO: Like Runabout, Runamuck is more than happy to follow orders, as long as they mean he can cause destruction. Runamuck is often paired with Runabout, whom he shares a tight bond with, and often finishes his sentences. LAST KNOWN LOCATION: Nebulos (Spotlight #5). ABILITIES: In Scorpion mode, Scorponok can fire powerful blasts from his tail. BIO: due to the nature of his experiments, Scorponok is wanted by the Tyrest Accord. ALT MODES: Cybertronian Flying Cannon. ABILITIES: In robot mode, Shockwave's left hand is replaced with a powerful canon. BIO: Shockwave is one of the most feared and powerful Decepticons, but where others are ruled by greed, ambition or an unchecked lust for power, his only master is cold, clear, dispassionate logic. Spur plus reaction equals outcome. This equation shapes and defines his thoughts and deeds. Infinitely patient, he sees the shape of things to come and so acts accordingly. (Simon Furman, Shockwave Spotlight). LAST KNOWN LOCATION: Unknown (Transformers #16). ALT MODES: Beast, Cybertronian Tank, Cybertronian Star Fighter, Cybertronian Flying Cannon, Cybertronian Armoured Carrier. ABILITIES: Sixshot has five different alt. modes. APPEARANCES: Transformers #16, Spotlight #4. MEMORABLE QUOTES: "It's not me staring into the abyss... I am the abyss." BIO: Sixshot's life is defined by his sheer, almost limitless capacity for destruction and mayhem. With six distinct modes, all of lethal design and intent, he is one of a kind, feared-almost equally-by both Autobot adversaries and Decepticon allies. He is, in every sense of the expression, a living weapon. But Sixshot is also alone, isolated and shunned. (Simon Furman, Sixshot Spotlight). * Skullcruncher was amongst the Decepticons who engaged Thunderwing on Nebulos during his second comming. (Transformers #9). PRIMARY FUNCTION: Infiltration Unit-Non-standard Combat Specialist. ALT MODES: Earth F-22 Raptort. ABILITIES: In robot mode, Skywarp has lasers mounted on both arms. Skywarp has the ability to teleport himself and others across small distances. BIO: Skywarp is somewhat a regular Decepticon soldier. He does what he’s told to do, and appears quite happy when causing destruction. Skywarp is often paired with Blitzwing. LAST KNOWN LOCATION: Earth (Spotlight #6). CURRENT STATUS: Offline (Transformation Lock)(Spotlight #6). ALT MODES: Earth Cassette Player. ABILITIES: Soundwave is able to "Mass Displace". APPEARANCES: Transformers #7, Spotlight #6. MEMORABLE QUOTES: "Someone has to stop them, I have to stop them." "Against my better judgement, I find myself oddly determined to do the right thing." BIO: Soundwave trusts no one, and no one trusts him. He appears to serve the Decepticon cause but serves himself first and foremost. Charged with policing the pumps and processors of his fellow Decepticons, he does so with zeal. To him, knowledge is power, and he knows everything there is to know about everyone...except, perhaps, himself. LAST KNOWN LOCATION: Earth (Transformers #6). CURRENT STATUS: Offline (C.R. Chamber) (Transformers #6). ALT MODES: Earth F-22 Raptor. ABILITIES: In robot mode, Starscream has lasers mounted on both arms. BIO: Starscream seem to be driven by one thing, his thirst for power. LAST KNOWN LOCATION: Cybertron (Spotlight #5). 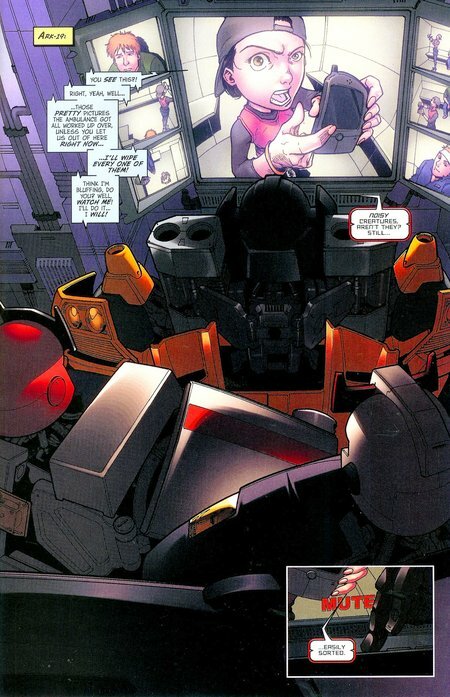 BIO: Swindle is wanted by the Tyrest Accord, he is capable of dealing his way out of any situation. LAST KNOWN LOCATION: Mumu-Obscura (Spotlight #4). UNIT MEMBERS: Sinertwin, Blot, Cuththroat, Rippersnapper. BIO: The Terrorcons idolise Sixshot, and have began mirroring his talent for destruction and carnage. PRIMARY FUNCTION: Infiltration Unit – Soldier. APPEARANCES: Transformers #0-#2, #6, #12, #16. BIO: Thundercracker is a reliable soldier and quite enjoys causing destruction. 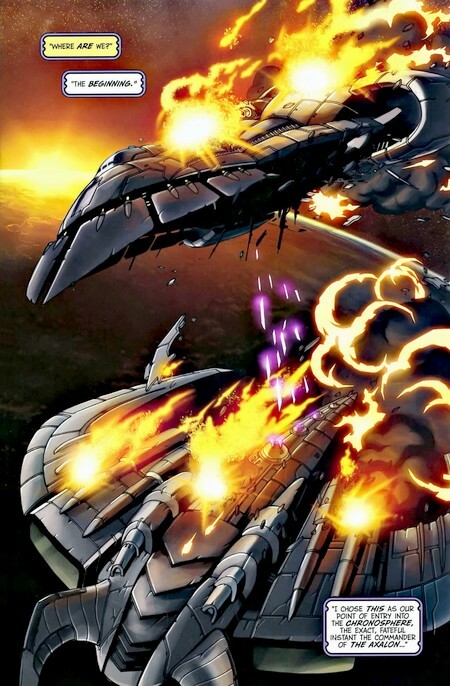 * Skywarp brought Thindercracker in to assist in Brasnya. ABILITIES: As a result of the bio-cybernetic grafting process Thunderwing became an entity of seemingly limitless power and destructive capability. Unfortunately, the process also destroyed his mind. BIO: Thunderwing was a brilliant Decepticon scientist. He was the first Cybertronian (except for Shockwave) to realize that the Autobot-Decepticon war was destroying Cybertron and depleting its resources. He developed the bio-cybernetic polydermal grafting process in order to provide a way for Cybertronians to survive the coming apocalyse. LAST KNOWN LOCATION: Cybertron (Transformers #8). CURRENT STATUS: Online (Transformers #8). LAST KNOWN LOCATION: Decepticon Spacecraft Thanatos. (Transformers #10). LAST KNOWN LOCATION: Earth. (Transformers #12). CURRENT STATUS: Alive. (Transformers #12). LAST KNOWN LOCATION: Gorlam Prime (Spotlight #2). CURRENT STATUS: Online (Spotlight #2). ABILITIES: While in vehicle mode, Blackjack can release small explosives from his boot. 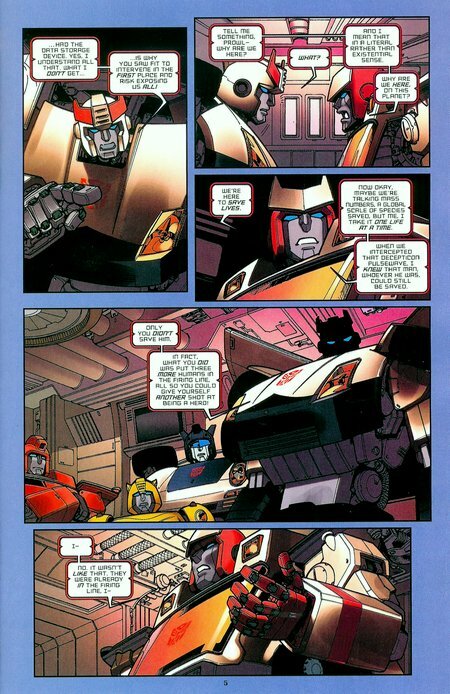 * Blackjack was part of the team who assisted in the capture of Nightbeat on Gorlam Prime. CURRENT STATUS: Alive (Transformers #16). MEMORABLE QUOTES: "and we laugh in the face of danger... did I really just say that?" BIO: Verity's tough exterior hides a scared and lonely girl. After bouncing from foster care to state assisted housing, Verity struck out on her own and become little more than a petty thief. 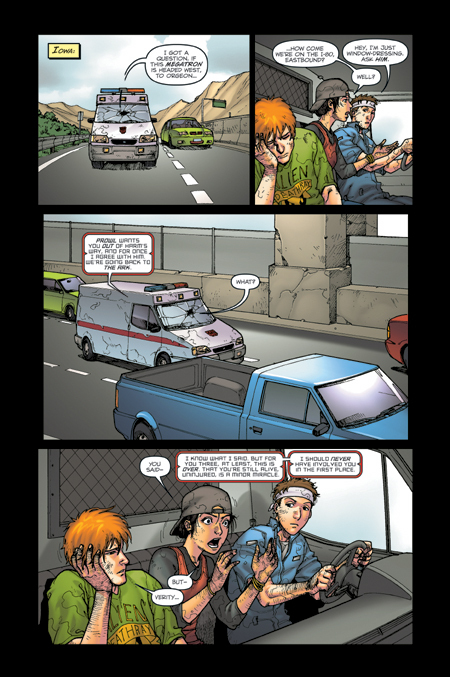 * After stealing a pocket computer, Verity met Hunter O'nion and shortly thereafter, was attacked by the Decepticon Thundercracker, with the help of Ratchet, they were able to escape and meet up with Jimmy Pink, an internet friend of Verity. * After discovering the Decepticons had abandoned their Nebraska base, Verity, with Hunter, Jimmy, Ratchet and Bumblebee investigated the shut down base. After learning that Hunter may still be alive, Verity is determined to rescue him. * Verity and Jimmy were knocked unconscience after she tripped a sensor in a custom wheels shop, that is believed to be linked to the Machination. 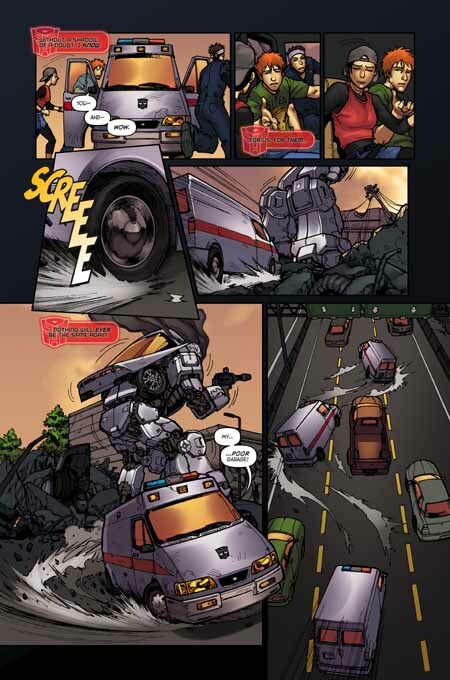 * Verity and Jimmy were resuced by Ratchet and Ironhide, allthough Ironhide suffered severe damage. CURRENT STATUS: Alive (Transformers #15). *Clive is part of the team of archeologist who uncoverred Shockwave and the Dynabots in Nevada. CURRENT STATUS: Active (Spotlight #5). BIO: The Cranium is a group of maverick Nebulan scientists. * The Cranium were working with Mo Zarak to develop a "transformable" man, with technlogy provided by Scorponok. LAST KNOWN LOCATION: Earth (Transformers #12). CURRENT STATUS: Active (Transformers #12). APPEARANCES: Transformers #11 - #12. BIO: Mr. Creel is a member of Drake's Unit. BIO: Mr. Dante is a leading member of the Machination. * Mr. Dante is wroking with a Decepticon to develop a new form of transformation. BIO: Drake is the leader of a group of Mercenaries who have access to advanced technology. * Drake's unit succesfully captured Sunstreaker and Hunter. * Drake's unit have been traced to a custom wheels shop, were a trap has caught Jimmy and Verity. BIO: Drake's Unit is a group of Mercenaries who have access to advanced technology. *Proffesor Goring is in charge of the team of archeologist who uncoverred Shockwave and the Dynabots in Nevada. BIO: Mr. Goss is a member of Drake's Unit. BIO: Alexander Holt is a facsimile, a bio-engineered being designed with the sole purpose of serving the Deception's agenda. * Alexander Holt has been used to bring the U.S. into the Brasnian situation. LAST KNOWN LOCATION: Earth (Transformers #2). CURRENT STATUS: Alive (Transformers #2). * Mr. Jolly is wroking with a Decepticon to develop a new form of transformation. BIO: Mr. Kamon is a member of Drake's Unit. PRIMARY FUNCTION: Brasnyian Freedom Fighter. LAST KNOWN LOCATION: Ark-32. (Transformers #16). CURRENT STATUS: Dead. (Transformers #16). BIO: Georgi Koska is a facsimile, a bio-engineered being designed with the sole purpose of serving the Deception's agneda. * Georgi Koska innitiated hostilites in Brasnyia against the Russians. * Georgi is the only known being in the galaxy who has had the honour of weilding Megatron as a weapon. * While Hot Rod was attempting to secure Georgi Koska, he was killed. LAST KNOWN LOCATION: Orbiting Gorlam Prime (Spotlight #2). CURRENT STATUS: Dead (Spotlight #2). MEMORABLE QUOTES: "There's a hole in the world." * Krakon uncovered the flight recorder from the orriginal Ark on Gorlam Prime. * After contacting Nightbeat, Krakon was killed by an unknown assailant. LAST KNOWN LOCATION: Zull (Spotlight #5). CURRENT STATUS: Alive (Spotlight #5). MEMORABLE QUOTES: "You have no authority here Cybertronian." BIO: Lorcha has converted the planet Zull into a fortress. * Lorcha was giving shelter to Swindle, while he was being tracked by Ultra Magnus. CURRENT STATUS: Active (Transformers #16). UNIT MEMBERS: Mr. Dante, MS Stevenson, Mr. Jolly. BIO: The Machination is a group of Humans who have discovered the existence of the Transformers. * The Machination employed Drake's unit to capture a transformer. * The Machination are performing experiments of Hunter. * The Machination are working with an unkown Decepticon, trying to develop some form of new transformation. LAST KNOWN LOCATION: Ki-Aletta (Spotlight #3). CURRENT STATUS: Online (Spotlight #3)..
BIO: Omega Guardians are responsible for guarding the Magnificence. * The Omega Guradians were unsuccesful in stoping Hot Rod's T.R.U. from obtaining the Magnificence. CURRENT STATUS: Alive (Captured) (Transformers #16). APPEARANCES: Transformers #0-#6, #11, #16. MEMORABLE QUOTES: "Two words, Siege Mode." BIO: Hunter ran a website dedicated to proving the existence of Transformers. 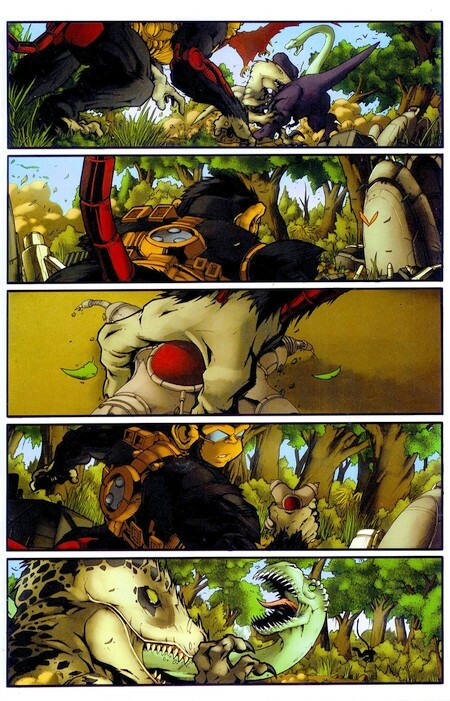 * While out exploring the desert, Hunter met Verity, and then Ratchet and Jimmy after being attacked by Thundercracker. * Hunter was also part of the team investigating the Decepticon base in Nebraska. * While he was being escorted back to his home, Hunter and Sunstreaker were attacked by the Machination and was thought to have been killed. * It has since been revealed that Hunter is still alive, but he is being experimented on by the Machination. MEMORABLE QUOTES: "There's a word for our sort, some new-age, pc bit of psychobabble, oh yeah, that's it. Freak!" BIO: Jimmy owned and ran his own Mechanic garage. * After meeting Verity, Hunter and Ratchet, Jimmy's garage was destroyed by the Decepticons Runabout and Runamuck. * Jimmy was part of the team investigating the Decepticon base in Nebraska. * After learning that Hunter may still be alive, Jimmy is determined to rescue him. * Jimmy, along with Verity, Ratchet an Ironhide have followed the Machination's trail to a custom wheels shop, where he and Verity were knocked unconsience by an unknown gas. 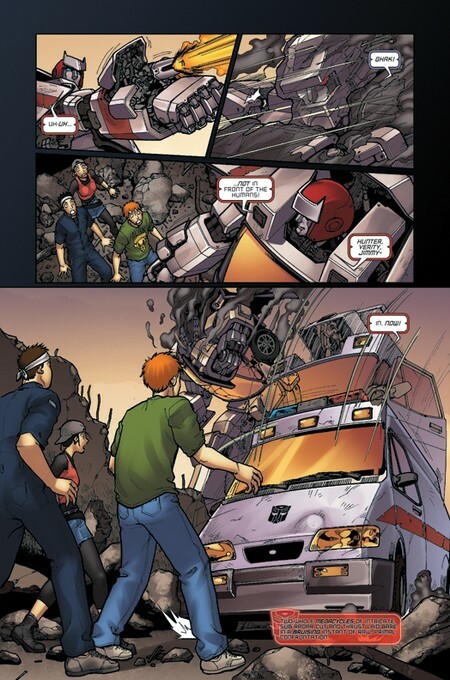 * Jimmy and Verity were rescued by Ratchet and Ironhide, allthough Ironhide suffered severe damage. LAST KNOWN LOCATION: Mumu-Obscura (Transformers #16). BIO: The Reapers are a group of different species. There goal is ending galactic war. * The Reapers kidnapped the Terrorcons in an attempt to recruit Sixshot. * After learning that Sixshot was called to Earth, The Reapers have decided to follow him. BIO: Joshua Red is a member of Skywatch. * Joshua was present when Laserbeak was uncoverred at Mt. Helens. * Joshua is part of the team who are holding Laserbeak and Ravage captive. ABILITIES: While in vehicle mode, Roadhugger has a bonet-mounted weapon. * Roadhugger was part of the team who assisted in the capture of Nightbeat on Gorlam Prime. BIO: Mr. Schmidt is a member of Drake's Unit. CURRENT STATUS: Active (Transformers #15). APPEARANCES: Transformers #15, Spotlight #6..
BIO: Skywatch are a group of Humans, who have discovvered the precense of Cybertronians on Earth. * Once becoming aware of Shockwave and the Dynobots, Skywatch took control of the Nevada dig site. LAST KNOWN LOCATION: Earth (Transformers #4). CURRENT STATUS: Dead (Transformers #4). APPEARANCES: Transformers #0 - #4. BIO: Mr. Stoker is an agent of the Machination. * Stoker was able to infiltrate the Decepticon command bunker in Nebraska. * After his efforts were disovered by the Decepticons, Stoker was killed by Runabout & Runamuck. * All the information Stoker gathered on the Decepticons, was stored on a storage device, which was stolen by Verity Carlo. CURRENT STATUS: Active (Transformers #14). APPEARANCES: Transformers #13 - #14. BIO: Captain Todorof has been a member of the Russian army for sixteen years. * Capatin Todorof was in Brasnya when the Autobot and Decepticon forces collided. * After first laying eyes on a Transformer, Todorof tried to contact Major Arkurin. BIO: Mr. Weis is a member of Drake's Unit. CURRENT STATUS: Unknown (Spotlight #5). 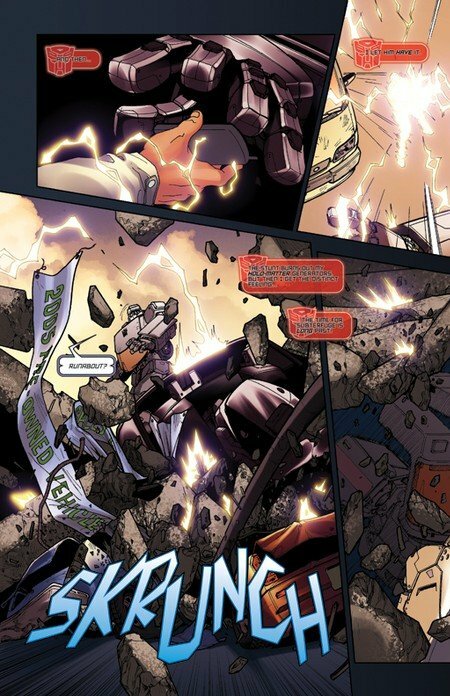 * While firing at Ultra Magnus, Scorponok accidentally hit Zarak, it is unknown wether he survived. DESCRIPTION: Transformers are a sentient race of mechanical beings. Transformers are highly advanced and are capable of "transforming", which is the process by which their physical form is changed to a vehicular mode. APPEARANCES: Transformers #0-#15, Spotlight #1-#6. * The Transformers are divided into two main factions: Autobots and Decepticons. 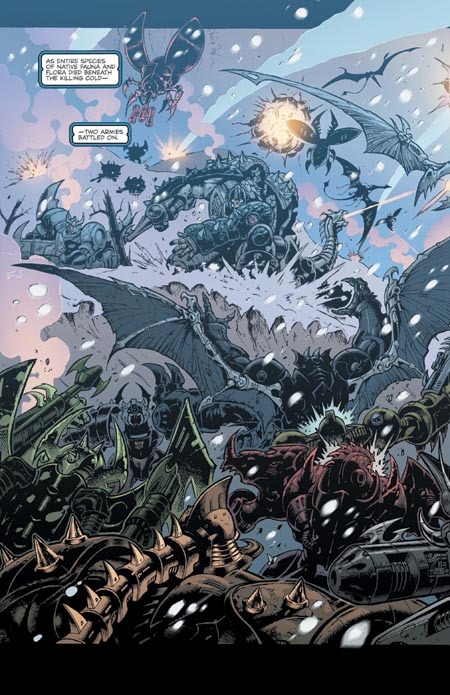 DECRIPTION Deathbringers are a race of bi-pedal creatures. *An un-named Deathbringer is the leader of the Reapers. DECRIPTION The Gorlamians are a race of bipedal beings, very simular to humans. * Sometime in their timeline, the Gorlamians began upgrading their organic bodies to bio-mechanic. DECRIPTION Humans are a race of bipedal beings. APPEARANCES: Transformers #0-#6, #11-#15, Spotlight#1, #6. * Most humans are unaware of the existance of Cybertronians, but there are small faction which do. DECRIPTION Hyperians are a race of sentient biomechanical beings. DECRIPTION The Nebulans are a race of green bipedal beings, very simular to humans. APPEARANCES: Transformers #8-#9, Spotlight #5. 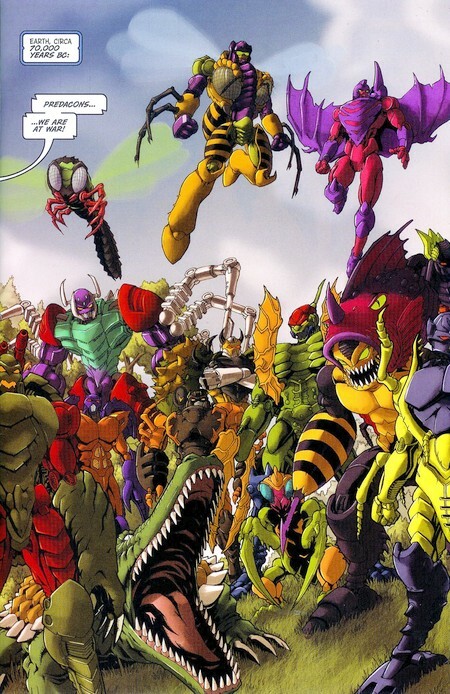 * A group of Nebulans were involved in Scorponok's experiments. * Nebulos was savagely attacked by Thunderwing during his second coming. DECRIPTION Ravenous' are a race of winged creatures. * An un-named ravenous is a member of the Reapers. DESCRIPTION: Zullians are a race of bipedal beings. LAST KNOWN LOCATION: Ye Olde Times. BIO: In a war where secrecy and misdirection are the ultimate weapons, he is king. Never one to give anything away unless it suits his direct agenda, he is trusted by everyone and no-one. BIO: In IDW, crimes of a spam nature are considered especially heinuos, and are handled by an elite group known as the Anti-Spam Unit, their leader, is Thunder-Ryall. * Prowl's Tactical Response Unit have hidden their spacecraft at the bottom of Lake Michigan. * The Cult of Thunderwing used Mount St. Helens as their base of operations while retrieving a supply of Ore-13. * While attempting to stop the Cult of Thunderwing, Soundwave, Ravage and Laserbeak were trapped in Mount St. Helens. * Skywatch uncovered Laserbeak in Mount St. Helens. * Starscream and his Infiltration Unit orriginally used Nebraska as their base of operations, but abandoned it once they discoverred Ore-13. 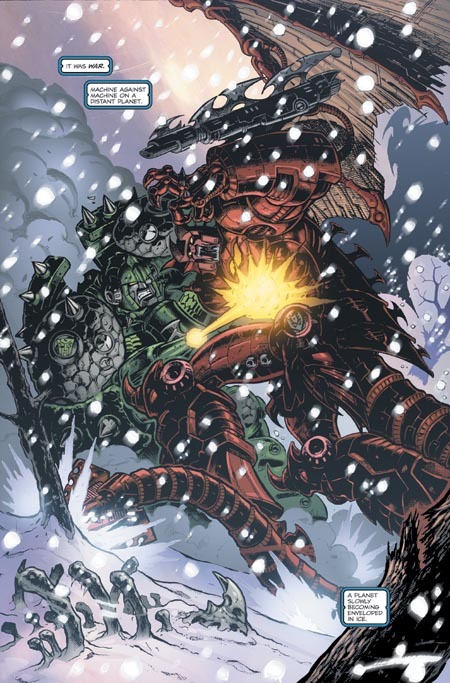 * After their battle, Shockwave and the Dynabots were burried under a sea of lava in Nevada. * A group of human archeologists, led by Proffesor Gorring, uncoverred Shockwave and the Dynabots in Nevada. * Skywatch, a division of the American Government, secured the Nevada dig site. * After discoverring Ore-13, Starscream and his Infiltration Unit relocated to Oregon. * Thunderhead passis where Thunderwing was finally defeated after his rampage of Cybertron. *Ultra Magnus recaptures Swindle on the planet Buras. SOLAR SYSTEM: Shaula (330 Light Years from Sol System). *After a civil was, lasting for millions of years, Cyberton is currently a wasteland, incapable of sustaining normal living conditions. *Earth is where Starscream discovered Ore-13, as a result, Earth is now a major battlefield in the Cybertronian civil war. * Gorlam Prime is currently undoing a jump in evolution, with the Gorlamians upgrading their organic forms to bio-mechanical. * There is a large dimensional portal deep beneath the planet's surface. *There is a Decepticon High Justice on Karashi-Delta. *Mumu-Obscura was devastated by the Reapers, while there, they tried to recruit Sixshot. *Scorponok was performing experiments with the help of Mo Zarak and The Cranium on Nebulos. *Thunderwing devastated Nebulos after he was resurected. *Hot Rod sucessfully broke Dealer out of Styx. * The Decepticons have engaged Siege mode on Varas Centralus, and the local Autobots, led by Blue Streak, had called in the Wreckers to assist. *The surface of Ys'Devian was destroyed by Sixshot. *Zull has been converted into a fortress by Karzia Lorcha. *Ultra Magnus penetrated the walls of Zull to capture Swindle. DESCRIPTION: Infiltration is the term given to the military protocol used by the Decepticons to deplete a planet of it's energy. The Infiltration protocol consist of 6 phases. DESCRIPTION: In preparation for the oncoming energy shortage, Shockwave created Regenesis, which involved launching stockpiled Energon into space and seeding distant planets and then stabilizing the Energon, resulting in an element: Ore-13. DESCRIPTION: Siege Mode is a proactive military configuration of the Infiltration protocol. It is usually adopted in phase five. DESCRIPTION: The Tyrest Accord was created to "police" the Cybertronian civil war. One of the most fundamental tenets of the allied code of interplanetary conflict is the "non-interaction accord", which limits the sharring of Cybertronian science. KNOWN CREW MEMBERS: Perceptor, Sizzle, Siren. LAST KNOWN LOCATION: Earth, Lake Michigan (Transformers #13). KNOWN CREW MEMBERS: Prowl, Rathcet, Ironhide, Sunstreaker, Jazz, Wheeljack, Bumblebee. LAST KNOWN LOCATION: Earth, En route (Transformers #10). LAST KNOWN LOCATION: Earth orbit (Transformers #15).KNOWN CREW MEMBERS: Nightbeat, Hot Rod, Hard Head. LAST KNOWN LOCATION: Cybertron, Destoyed (Transformers #8).KNOWN CREW MEMBERS: Jetfire, Scattershot, Strafe, Lightspeed, Nosecone, Afterburner. LAST KNOWN LOCATION: N/A (Transformer #8). KNOWN CREW MEMBERS: Optimus Prime, Blaster, Searchlight, Pincer. LAST KNOWN LOCATION: Cybertron, orbit(Transformers #10). KNOWN CREW MEMBERS: Razorclaw, Rampage, Tantrum, Divebomb, Headstron, Barrage, Spinister, Triggerhappy, Carnivac, Blast Off, Windsweeper. KNOWN CREW MEMBERS: Springer, Sandstorm, Boradside, Topspin, Twintwist, Roadbuster, Whirl, Scoop. SPECIES OF ORIGIN: Cybertronian (Decepticon). IMPLICATIONS: A Cyb-org, is a being that is composed of both organic and cybernetic components. Such technology has been used in experiments by the Decepticon Scorponok on the planet Nebulos. IMPLICATIONS: A Facsimile is a bio-technological organism, which is grown in a fusion tube. Facsimiles are modelled after the indigeneous species of a planet. These facsimiles are completely obedient and are often used by the Decepticons to assist in the "infiltration" of a society. Some Facsimilies believe they are real creatures until they are activated. IMPLICATIONS: The Pretender Process is a "shell" which envelopes a transformer to protect it against outside factors. The Pretender Process also grants the user superior strength and capabilities. The Pretender Process was developed by the Decepticon scientists Thunderwing, to protect against Cybertron's decay atmosphere. The process has since been out-lawed, due to Thunderwings resultant rampage which nearly destroyed Cybertron. Unless properly neuro-aligned, any transformer bonding with a pretender shell risks serious cerebral damage and a possible variety of side-effects, ranging from coma to insanity. SPECIES OF ORIGIN: Cybertronian (Autobot). IMPLICATIONS: A Holoavatar is a hard light construct, usually of an indigenous species, utilized by the Transformers to further "Infiltrate" a society. The Holoavatar is connected via remote link to a Transformer and some weapons used against a Holoavatar can have effects on its user. IMPLICATIONS: A Holoconference Headset allows an image of the user to be transmitted along with audio to another location for communication purposes. IMPLICATIONS: Some Holoavatars are capable of discharge jolts of energy, which can temporarily incapacitate Transformers. IMPLICATIONS: A Holomap is a virtual display of a specific area, along with terrain, it also shows any other beings in the area. IMPLICATIONS: A Holomatter Disguise enables the user to change their physical appearance to any form. IMPLICATIONS: A Holomatter Projector is not unlike a Holoavatar, except it is capable of projecting multiple constructs and is not directly linked to the user. IMPLICATIONS: Holomatter Scanners are capable of detecting any Holomatter projections. IMPLICATIONS: The Axis Cradle is utilized to give the user full control over another Transformer, even across the vast distances of space. IMPLICATIONS: When a Transformer becomes damaged and requires above average repairs, they can be placed into Cryogenic Regeneration Chambers to "heal". C.R. Chamber can also be used for "reformatting" a Transformer, changing their physical structure. IMPLICATIONS: Cybertronian is the language of the Transformers. IMPLICATIONS: The Magnificence is believed to be an all-seeing Oracle. IMPLICATIONS: Ore-13 is a scientific replication of the Cybertronian element "Energon", the energy that gives the Transformers life. Ore-13 was created by the Decepticon Shockwave to prepare for energy shortages caused by the Transformer civil war. IMPLICATIONS: The Orbital Command Hub is the Autobots' main base of operations. It is where the "Prime" resides and is used to organize the Autobot's military operations. IMPLICATIONS: Space Stations are utilized by the Decepticons as small command outposts. IMPLICATIONS: Transformation is the ability posed by Transformers, which allows them to change their physical form. SPECIES OF ORIGIN: Human (Drake's Unit). IMPLICATIONS: Virtual Reality Simulators are used for training purposes, they are capable of simulating terrain and objects. IMPLICATIONS: Some Transformers a re capable of transmitting information over great distances to a ship. IMPLICATIONS: Chameleon Mesh allows the user to become "invisible" to normal detection capabilities. SPECIES OF ORIGIN: Cybertronian (Autobt). IMPLICATIONS: Some Transfomers are capable of transferring thier consciousness to stand-alone stations. IMPLICATIONS: Energy Manacles are used to restrain a Transformer. IMPLICATIONS: Ethergrids are devices used to project a digital display. IMPLICATIONS: Impact Pistols are used to launch projectiles into the ground. IMPLICATIONS: When a Transformer is wearing Warping Armor, they are not only protected against outside factors, but are almost rendered invisible to normal detection capabilities. IMPLICATIONS: while their consiousness is being transferred, a Transformer in stuck in limbo, a plane of existance outside normal reality. IMPLICATIONS: Mass Displacement is the process in which a Transformers changes not only their form, but also the size. Some Decepticons, such as Soundwave, seem to have this function as standard, while others like Megatron, require extra power supplied from "Ore-13" to perform this ability. IMPLICATIONS: A Null field is a protective bubble that a Transformer can generate around themselves. It protects them from impacts. IMPLICATIONS: An Orbital Relay is used to create a communication link with a ship in orbit. IMPLICATIONS: Personal shields protect the wearer from outside factors, such as atmospheric conditions. IMPLICATIONS: Portable Scanners are used to display information about the user's surroundings. They can also be used for tracking purposes. IMPLICATIONS: Synthetic Flesh is artificially created "skin" which shields a Transformer from high concentrations of Energon in the atmosphere. IMPLICATIONS: Tactical Scanners can generate an electronic blue print of structures and displays information on objects in the area. IMPLICATIONS: A Trojan Drone is a device which is able to hack into computer systems and over-ride it's programming. IMPLICATIONS: Transformers are capable of communicating by radio waves which are silent to conventional listening devices. IMPLICATIONS: Some Transformers posses the ability of self-propelled flight while in their "robot" form. This process is also replicated in a device. IMPLICATIONS: Ark is a class of Transformer space faring vessel, predominately used for transport / exploration purposes. The first Ark was lost not long into it's maiden voyage. IMPLICATIONS: Artificial Wormholes are another way of transporting matter across vast distances. IMPLICATIONS: Battle Cruiser is a class of Transformer space faring vessel, predominately used for combat purposes.FIRST APPERANCE: Transformers #8. IMPLICATIONS: Cargo Ships are generally used for transport of wares. IMPLICATIONS: A Dimensional Portal is used it transport larger objects across the galaxy. IMPLICATIONS: Escape Pod's are used when a space faring vessel is longer safe to inhibit. IMPLICATIONS: Escape Shuttle's are used for quick escape from a planet's surface. IMPLICATIONS: The Exploration is a class of Transformer space farring ship. IMPLICATIONS: A Foldspace Transition allows matter to be transferred from one part of the galaxy to another in a vastly shorter time than normal transportation capabilities. IMPLICATIONS: Orbital bounce is the means in which Transformers and or other items are transported across great distances. It can be utilized to travel from either once part of a planet to another or from a ship in orbit to the planet's surface. Orbital Bounces are un-detectable to lesser advanced species. SPECIES OF ORIGIN: Cybertronian (Tyrest Accord). IMPLICATIONS: Prisoner Transports are used for relocating criminals to a penal colony. Remote Orbital Bounce / Jump. IMPLICATIONS: An Orbital Bounce / Jump can be activated and controlled via remote. IMPLICATIONS: Some Transformer space craft can be piloted remotely via a portable device. IMPLICATIONS: Scientific Survey Vessel is a class of Transformer space faring vessel, predominately used for research purposes. The Scientific Survey Vessels are much weaker than other classes of ships. IMPLICATIONS: Teleportation allows Transformers to be transported across distances. It is commonly generated by a single Transformer. IMPLICATIONS: Warship is a class of Transformer space faring vessel, predominately used for combat purposes. SPECIES OF ORIGIN: Transformers (Autobot). IMPLICATIONS: Some Transformers are capable of dispursing Adhesive Smokescreen which is capable of temporarily blinding it's target. IMPLICATIONS: Some species are capable of generating a Backlash force field, which essentially a bubble of energy which reflects energy blasts. IMPLICATIONS: Some Transformers are capable of alterring the external structure of their vehicle mode to reveal Battering Panels,which are used for ramming purposes. IMPLICATIONS: Some Transformers have weapons built-in to their super-structure. On occasions, these weapons can be retracted and hidden. IMPLICATIONS: Centurion Drones are A.I. robots, employed as grunts by Transformers. IMPLICATIONS: Cloaked Perimeter Cannons are weapons which are usually in orbit around a planet, typically disguised as asteroids. Once an enemy is within range, the Cannons automatically fire upon them. IMPLICATIONS: Energy Melee Weapons are used by some Transformers for close combat, they are capable of penetrating average Transformer amour. IMPLICATIONS: Some species have the ability to create mini-earthquakes in a localized area. IMPLICATIONS: Flash Cannons are capable of generating a localised flash of high intensity light, affecting the vison of those in the target area. IMPLICATIONS: Ionization is utilized to "Ionize" the atmosphere in a localised location, once in affect, the guidance systems of all Transformers in the designated area are disrupted. IMPLICATIONS: Mechanical Drones can be small vehicles controlled via remote access. IMPLICATIONS: Mechanoid Scramblers are attached to a Transformer to over-ride their systems. IMPLICATIONS: Mechanoid Sentrys are large robots who can be used for guarding purposes. IMPLICATIONS: Microwave weapons are capable of creating energy waves which react violently with pockets of gas in the atmosphere. IMPLICATIONS: A Molecular Destabilizer shatters the molecular structure of all materials within it's target area. IMPLICATIONS: Plasma Density Charges are powerful explosive devices. IMPLICATIONS: A R-Infinity Accelerator is a powerful hand held weapon which draws its power from the heart of a collapsed star. IMPLICATIONS: Seeker Warheads are missiles which can "track" their target. IMPLICATIONS: Sonic Barrage Pistols discharge powerful energy blasts. IMPLICATIONS: A Sonic Wave Blaster emits powerful waves on sonic energy, capable of temporarilly shorting out a Transformer's internal systems. IMPLICATIONS: Starblitz Torpedoes can be launched form a ship in orbit and are capable of destroying planets. IMPLICATIONS: Developed by the Decepticon Shockwave, this weapon overrides a Transformers primary transformation cog, locking the target in their alt mode. IMPLICATIONS: Some Transformers are capable of storing their hand-held weapons in built-in compartments. Nano-Klik: Approximately 1 Earth second. Klik: Approximately 1.2 Earth Minutes, Aprroximately 72 Nan-Klicks. Cycle: Approximately 1.25 Earth hours, Approximately 62.5 Klicks. Mega-Cycle: Approximately 93 Earth Hours, Approximately 77.4 Cycles. Deca-Cycle: Approximately 3 Earth Weeks, Approximately 403.2 Cycles. Meta-Cycle: Approximately 13 Earth Months, Approximately 7488 Cycles. On a wholly metallic planet populated by robotic beings given life and "Spark" by an energized ALLSPARK of unknown origin, war has taken hold—a war for control of the ALLSPARK! With peace shattered, OPTIMUS PRIME takes a daring chance to protect the ALLSPARK from the malevolent MEGATRON, casting the planet's very life force into the depths of space. But now, after countless time has passed, the search for the power to rule CYBERTRON—as well as the AUTOBOTS and DECEPTICONS charged with finding it—has come to Earth. The official adaptation of Transformers: The Movie picks up directly where the Movie Prequel leaves off—the TRANSFORMERS’ brutal war has come to Earth and perhaps our only chance for survival may be with the young boy who just might hold the key to ending the war forever. AUTHOR: Simon Furman / Chris Ryall. STORY: Travel from CYBERTRON to Earth as we see what momentous events led to the Transformers bringing their war to our world. 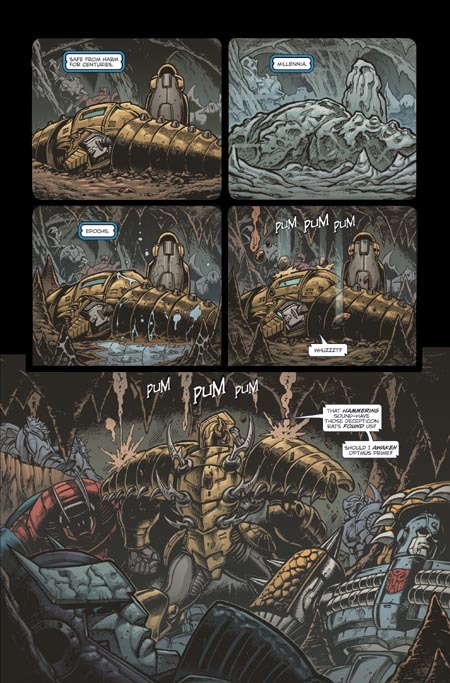 In issue one, BUMBLEBEE and a cadre of AUTOBOTS experience the lethal battle of Tyger Pax! CAST: Bumblebee, Optimus Prime, Arcee, Megatron. STORY: MEGATRON is headed to Earth, in search of the ALLSPARK. But what he finds, and what this means for the ongoing war that’s come to our world, is something he never could’ve expected! CAST: Bumblebee, Optimus Prime, Megatron, Captain Witwicky, Wienke Danco, Sector 7. CAST: Bumblebee, Jazz, Ratchet, Megatron, Blackout, Barricade, Brawl, Starscream, Captain Witwicky, Ron Witwicky, Judy Witwicky, Sam Witwicky, Agent Simmons. STORY: Their war has come to our world. Now, as the Robots in Disguise continue their struggle on the planet Earth, only the organization known as Sector 7, and an Autobot named BUMBLEBEE, stand in the way of total victory for the DECEPTICONS! CAST: Bumblee, Starscream, Barricde, Blackout, Agent Simmons, Sam Witwicky. RELATED ISSUES: Prequel #1-#4, Movie #1. RELATED ISSUES: Prequel #1-#4, Movie #1-#2. RELATED ISSUES: Prequel #1-#4, Movie #1-#3. LAST KNOWN LOCATION: Cybertron (Prequel #1). CURRENT STATUS: Online (Prequel #1). * Arcee was amongst the Autobots led by Bumblebee assigned to distracting the Decepticons at Tyger Pax while the All Spark was launched into space. LAST KNOWN LOCATION: Earth (Prequel #4). CURRENT STATUS: Online (Prequel #4). MEMORABLE QUOTES: "They say I'm a Hero, I say, I did my job." BIO: Bumblebee is a very dedicated soldier. All though it pains him to do so, Bumblebee will put the greater good above the lives of his troops as well as himself. * Bumblebee led the Autobot contigent assigned to distracting the Decepticons at Tyger Pax while the Allspark was launched into space. * While stalling Megatron, Bumblebee suffered irreversable damage to his voice capacitor. 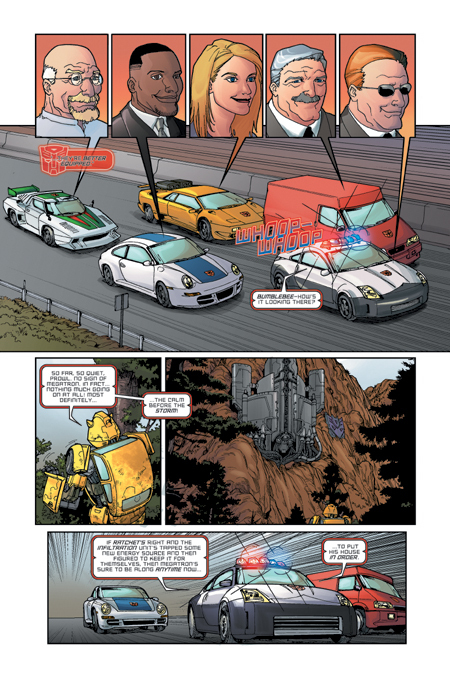 * Once he was reparied, Bumblebee left Cybertron to follow Megatron and stop him from obtaining the Allspark. * After his arrival on Earth, Bumblebee converted his alt-mode to that of a Chevy Camero. * Bumblebee hacked into the World Wide Web to search for information on the Allspark. * While en route to the "faux" Allspark, Bumblee encoutner Barricade, who let him escape in order to follow his movements. MEMORABLE QUOTES: "As long as there is hope, there is life!" BIO: Optimus Prime is the leader of the Autobots, whose one goal is to keep the Allspark from Megatron. * To keep Megatron from obtaining the Allspark, Optimus Prime launched it innto space. LAST KNOWN LOCATION: Mars (Prequel #4). CURRENT STATUS: Online (Prequel #43). ALT MODES: Earth Polic Car. * Barricade was part of the Decepticon team or destroyed the Mars rover. 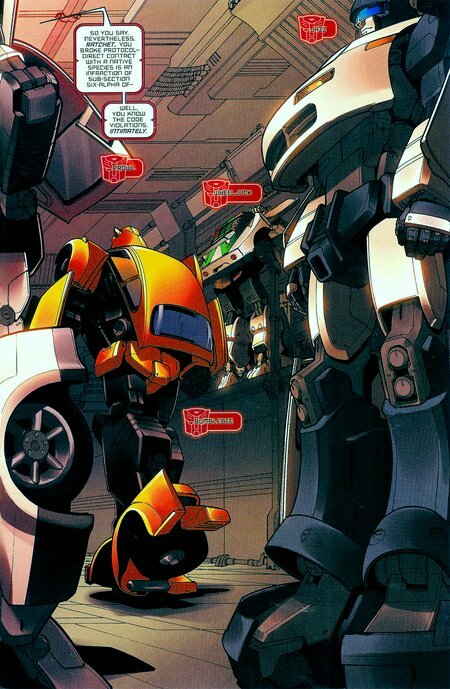 * After arriving on Earth, Barricade encountered Bumblebee while en route to the "Faux" Allspark. Barricade let Bumblebee escape in order to follow his movements. * Blackout was part of the Decepticon team or destroyed the Mars rover. * Blackout was part of Starscream's team who attempted to recover the "Faux" Allspark. PRIMARY FUNCTION: Lord High Protector . LAST KNOWN LOCATION: Earth (Prequel #3). CURRENT STATUS: Offline (Stasis Lock) (Prequel #3). MEMORABLE QUOTES: "Threats? what have I of Threats!" "On the day I claim the Allspark as my own.. all of Cybertron will fall... and the universe itself will tremble!" BIO: Megatron is the leader of the Decepticons, his single goal is obtaining the Allspark. * While attempting to obtain the Allspark at Tyger Pax, Megatron damaged Bumblebee's voice capacitor beyond repair. * When the Allspark was launched into space, Megatron followed it through the gallaxy to Earth. * Upon arriving on Earth, Megatron was trapped beneath the ice in Antarctica. * Megatron has since been uncovered by Captain Witwicky, and is now in the possesion of Sector 7, an division of the American Government. * Starscream was part of the Decepticon team or destroyed the Mars rover. * Starscream led a team of Decepticons to recover the "Faux" Allspark. LAST KNOWN LOCATION: Cybteron (Prequel #1). *Swindle was part of the Decepticon team who attacked Tyger Pax. CURRENT STATUS: Active (Prequel #4). BIO: Sector 7 is the American agency dedicated to extra-terrestial and supernatural research. * Sector 7 recovered Megatron's body from the Arctic circle. * Sector 7 utilized techlogy taken from Megatron to develop a number of new technologies. * Sector 7 were aware of Bumblebee's arrival on Earth, and are determined to capture him. * Using technology copied from the Allspark, Sector 7 have created a device capable of emulating his electronic signature. Sector 7 were unsucessful in using this device to capture a Transformer. CURRENT STATUS: Alive (Prequel #4). MEMORABLE QUOTES: "This... is bait." BIO: Agent Simmons is a member of Sector 7, he is said to be a "specialist" on Cybertronians. * Agent Simmons lead the team who were trying to trap Bumblebee with a faux Allspark. They were unsucessful. CURRENT STATUS: Dead (Prequel #3). MEMORABLE QUOTES: "Their war, our world." BIO: Captain Witwicky was a great explorer of the 19th centuary. * During a journey to Antarctica, Captain Witwicky and his crew, discovered Megatron beneath the ice. * Capatin Witwicky lost his sight when he uncovered Megatron. * After returning from his trip to the arctic circle, Captain Witwicky believed he could see the future, as result of this, he was instituionalized. CURRENT STATUS: Alive (Prequel #3). BIO: Judy is married to Ron Witwicky, the great grandson of Capatain Witwicky. BIO: Ron is the great grandson of Captain Archibald Witwicky. * Ron was in posession of the personal effects of Captain Witwicky, until he passed them onto his son, Sam. BIO: Sam is the great great grandson of Captain Archibald Witwicky. * Sam has inherited the personal effects of Captain Archibald Witwicky, which contains the glasses alterred by Megatron. * Bumblebee and his squad of Autobots distracted a group of Decepticons at Tyger Pax, in order to give Optimus Prime enough time to launch the AllSpark into space. IMPLICATIONS: Captain Witwicky's glasses were altered by Megatron, it is unknown how they were affected. IMPLICATIONS: Some Cybertronians are capable of changing into Protoform Comets, which are used for inter-stellar travel. 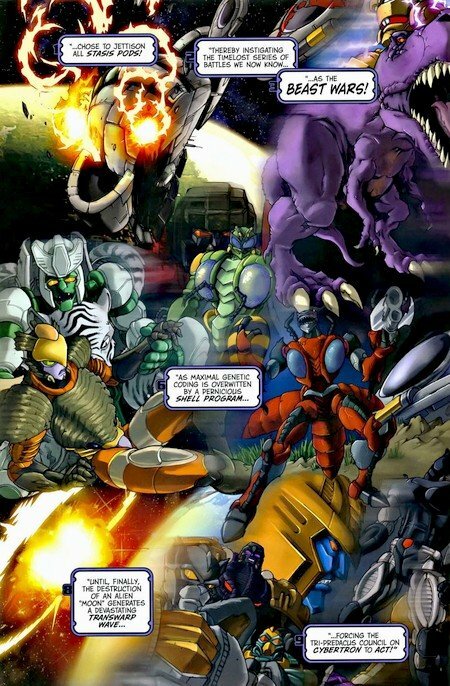 The Beast Wars- the time-lost series of conflicts on Earth, where heroic Maximals are pitted against evil Predacons- is celebrating its 10th anniversary with this special miniseries. As one strand of the Beast Wars rages on, another is just beginning. Predacon general Magmatron is on a mission to capture the renegade Megatron, but his true intentions are far more terrifying and revolutionary; his ultimate aim- to bring Cybertron itself to its knees. All he needs... is an army. And he knows exactly where to find one! STORY: In chapter one, as one strand of the Beast Wars rages on, another is just beginning. Predacon general Magmatron is on a mission to capture the renegade Megatron, but his true intentions are far more terrifying and revolutionary his ultimate aim - to bring Cybertron itself to its knees. All he needs is an army. And he knows exactly where to find one! 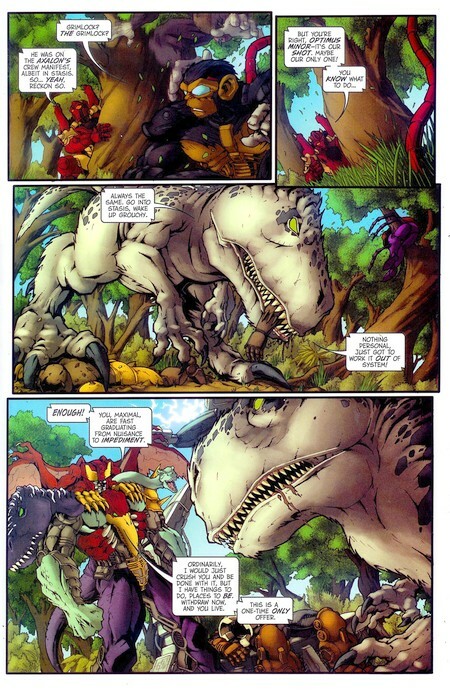 STORY: Deep cover agent Razorbeast is on the run, he and his new Maximal militia hunted by Magmatron and his superior Predacon force. 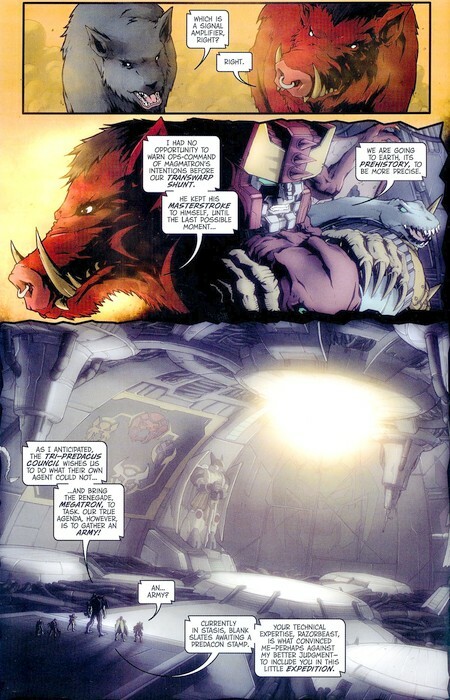 Razorbeast’s only viable play is to get a warning back to Cybertron, and to do that he needs a Transwarp Signal Booster. Where do you find one of those on prehistoric Earth? In Ravage’s downed Transwarp cruiser, that’s where! STORY: The action steps up into an even higher gear as Magmatron turns his attention to fulfilling his original (Tri-Predacus Council-approved) mission objective: capture Megatron and return him to Cybertron for trial. 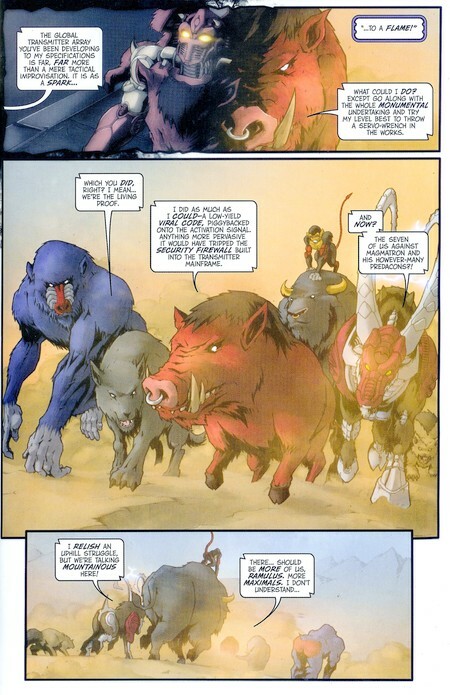 Does that mean he's prepared to just let Razorbeast and his Maximal militia be? Of course not. Not now that Ravage is on the case! STORY: The searing mini-series draws to a close, with pitched battles and desperate last stands on two fronts. 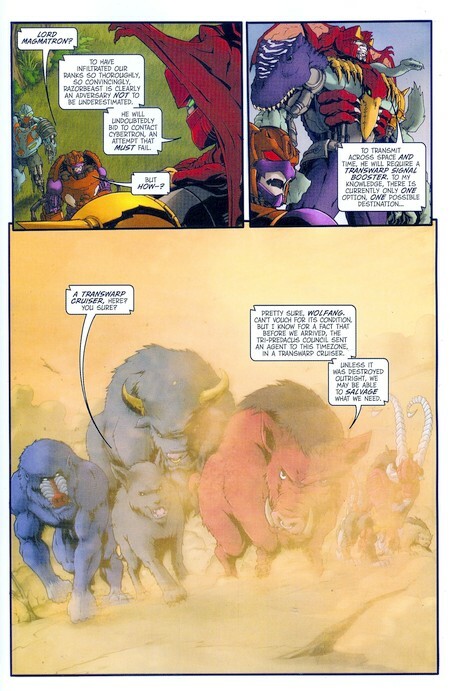 While Razorbeast stands alone against the all-powerful Magmatron, desperate to prevent his return to Cybertron, so his fellow Maximals must somehow survive the onslaught of Ravage and his massed Predacon forces and get a warning back to the future. No happy endings are guaranteed! Ever wondered what form your favorite Transformers would take if they existed in different eras? Wonder no more, as IDW's new Evolutions line will look at some special out-of-continuity tales involving the Robots in Disguise. In this standalone miniseries, writer Chuck Dixon and Transformers artist supreme Guido Guidi transplant the 'bots to the Industrial Revolution, where a charismatic hammer-man named John Henry discovers that a steam drill is really an alien robot named Bumblebee. Before he can process this information, the pair are attacked by Decepticons disguised as tanks, trains and walking engines. Is this all part of a larger scheme by Starscream? And if so, will the other Autobots arrive in time to stop his nefarious plans? STORY: Writer Chuck Dixon and artist Guido Guidi transplant the 'bots to the Industrial Revolution, where a charismatic hammer-man named John Henry discovers that a steam drill is really an alien robot named Bumblebee. Before he can process this information, the pair are attacked by Decepticons disguised as tanks, trains and walking engines. Is this all part of a larger scheme by Starscream? And if so, will the other Autobots arrive in time to stop his nefarious plans? CAST: Bumblebee, Prowl, Ironhide, John Henry, Cletus, Brawley, Tobias Muldoon, Kitty Merriweather, Stanford Merriweather, Jules Vern, Mark Twain, Starscream, Shockwave. STORY: Starscream plans to usher in an all-new age, one that means doom for John Henry and his iron-age Autobot associates. Astrotrain roll into New York City and change history forever? STORY: Tobias Muldoon must stop the Astrotrain from reaching New York... or face a world under the iron rule of the Decepticon!. His allies are the Autobots and the legendary steel-driving man John Henry. This issue features steam-driven, iron-clad action as the "Robots in Disguise" break cover to do battle at the dawn of the Industrial Revolution. LAST KNOWN LOCATION: Earth (HOS #4). CURRENT STATUS: Online (HOS #4). BIO: Bumblebee is a very outgoing Autobot, making new friends easily. Bumblebee formed a close freindship with the human John Henry. * After being awakened, Bumblebee was the first Autobot to interact with humans. * After learning of the human's technological capabilities, Bumblebee recomended the Optimus Prime be awakened and the Autobots assist mankind. * Once the presence of the Decepticons was know, Bumblebee and a group of Autobots and humans joined forces to defeat them. * Gears was part of the Autobot / Human team who defeated the Decpeticons. * Huffer was part of the Autobot / Human team who defeated the Decpeticons. * Ironhide was part of the Autobot / Human team who defeated the Decpeticons. LAST KNOWN LOCATION: Earth (HOS #1). CURRENT STATUS: Offline (Stasis Lock) (HOS #1). * Optimus Prime remained in stasis lock, while Bumblebee and the others battled the Decepticons. * Prowl was part of the Autobot / Human team who defeated the Decpeticons. * Ratchet was part of the Autobot / Human team who defeated the Decpeticons. CURRENT STATUS: Online (HOS #1). * Trax was brought back online to discus the Autobots assisting the Humans. CURRENT STATUS: Offline (HOS #4). * While transporting the Decepticons to New York City, Astrotrain was derailed and subsequently plummeted over a cliff. LAST KNOWN LOCATION: Earth (HOS #2). CURRENT STATUS: Online (HOS #2). * Bombshell, along with the other Insecticons, were tasked by Starscream to steel funds for Tobias Muldoon's plans. * Kickback, along with the other Insecticons, were tasked by Starscream to steel funds for Tobias Muldoon's plans. * Octane was present when Tobias Muldoon first met Starscream. LAST KNOWN LOCATION: Earth (HOS #3). CURRENT STATUS: Offline (Assumed De-Activated) (HOS #3). 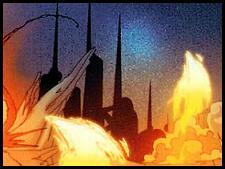 * Ravage was sent by Starscream to kill Tobias Muldoon, were he was defeated by Mark Twain. CURRENT STATUS: Offline (Assumed De-Activated) (HOS #4. * Scourge was defeated by Ironhide while trying to stop the Autobots and Humans from reaching the Astrotrain. CURRENT STATUS: Online (HOS #2. * Shockwave was the first Decepticon to interact with Humans. * After meeting Tobias Muldoon, Shockwave took him to meet Starscream. * Shrapnel, along with the other Insecticons, were tasked by Starscream to steel funds for Tobias Muldoon's plans. 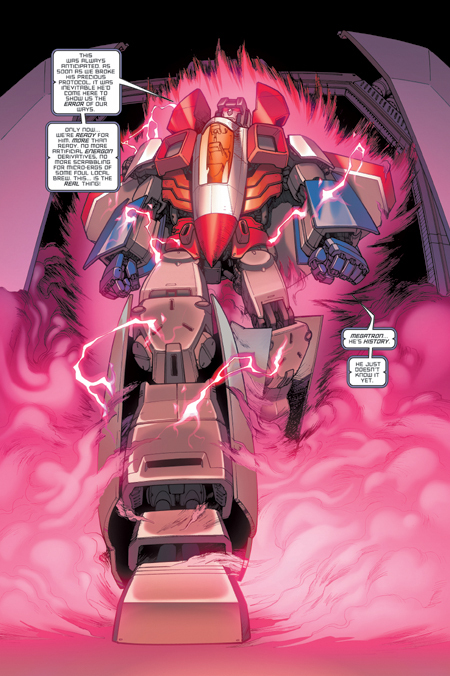 * Using Tobias Muldoon's designs, Skywarp was reconfigured for flight by Starscream. CURRENT STATUS: Online (HOS #3). * After Starscream learned of the Autobots presence, Squawkbox was ordered to inform all the Decepticons. CURRENT STATUS: Offline (Assumed De-Activated) (HOS #4). * With Megatron offline, Starscream took the role of Decepticon leader. * Starscream used Tobias Muldoon's techlogical knowledge to attempt to take over Earth. * Starscream partenered with Jacob Lee Bonnaventure, to gain access to more funds / materials. * Starscream was aboard the Astrotrain when it was sent over a cliff by Bumblebee and John Henry. PRIMARY FUNCTION: Rail Track Worker. CURRENT STATUS: Alive (HOS #4). CURRENT STATUS: Assumed Dead (HOS #4). Tof dat je dat doet.